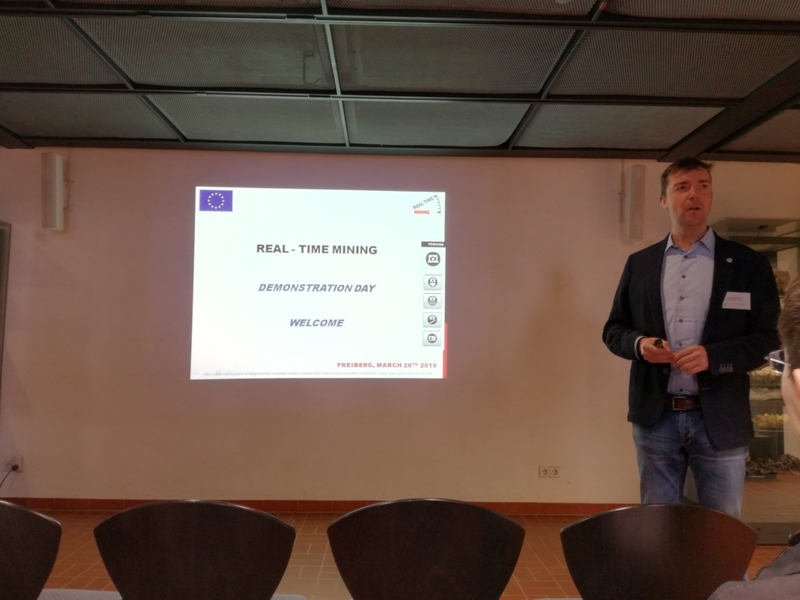 The UNEXMIN project co-organized the 2nd edition of the Real Time Mining Conference, in Freiberg, Germany, on the 26 and 27 of March 2019. 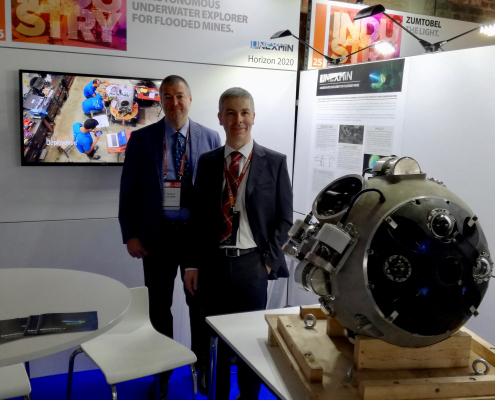 UNEXMIN worked together with the Real Time Mining and SOLSA projects – all Horizon 2020 raw materials funded – to bring together experts from raw materials exploration fields to debate the future of mining exploration. 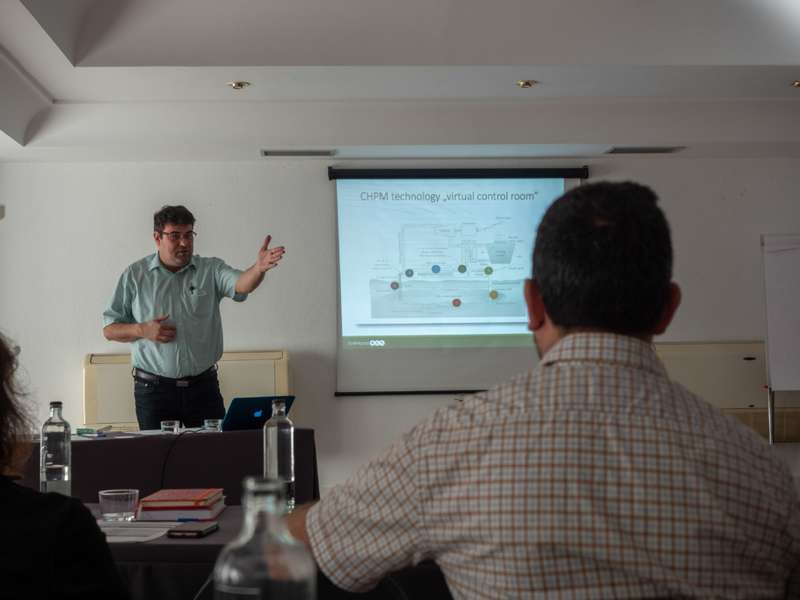 The first day of the conference included a demonstration of the Real Time Mining project outputs – both on the field and on the conference room. 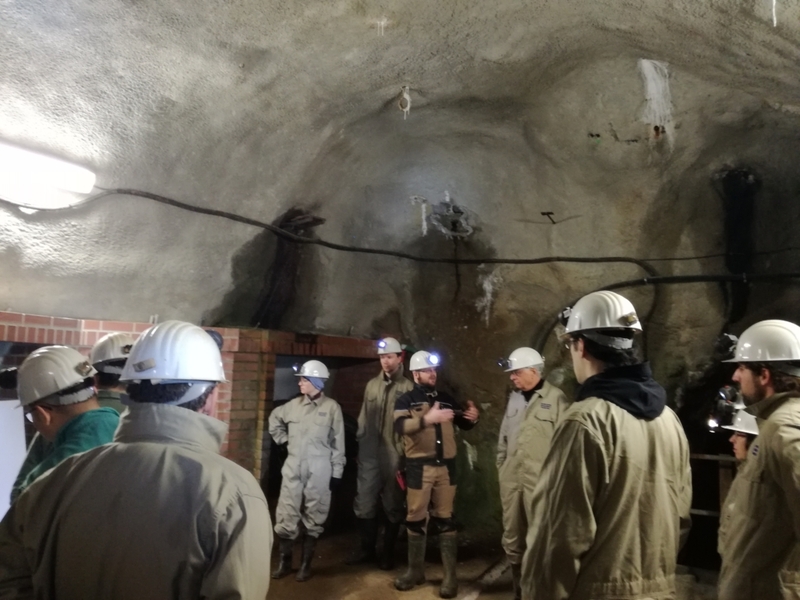 First, participants had the chance to go inside the Reiche Zeche mine, in Freiberg, where the Real Time Mining project personnel showed and explained their project’s activities. 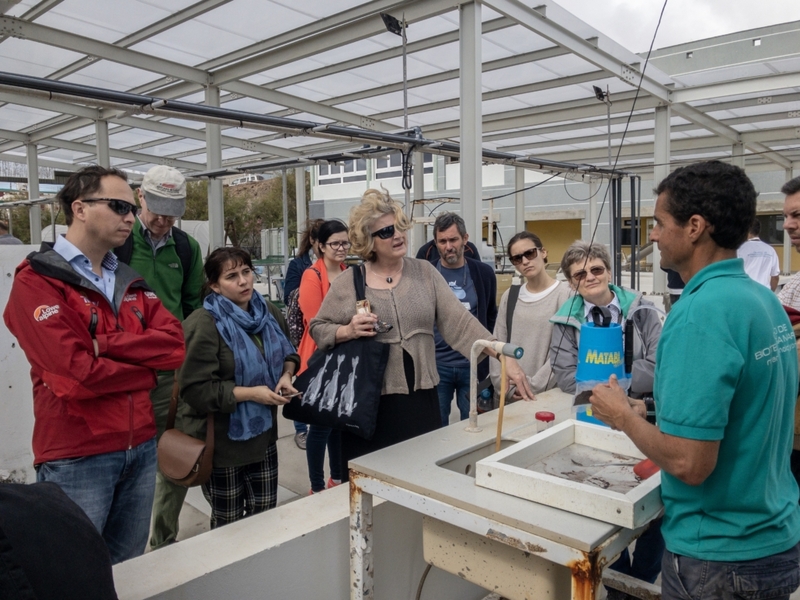 After the visit, participants were invited to learn more about the RTM project’s outputs, results and findings. 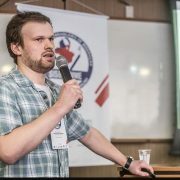 A series of short presentations introduced each of the Work Packages. 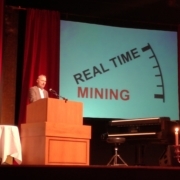 The actual 2nd International Real Time Mining Conference was held on the second day, the 27th of March. 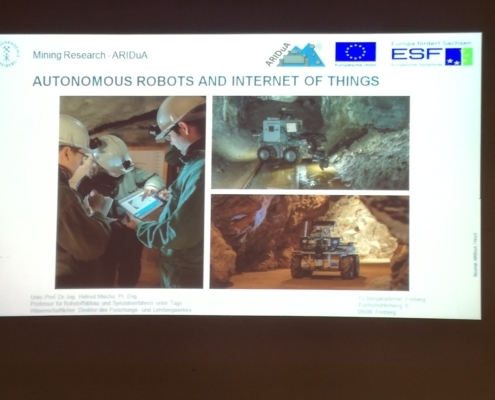 The conference brought together technical and overview talks from the UNEXMIN, Real Time Mining and SOLSA projects, and presentations from experts of the mining industry. 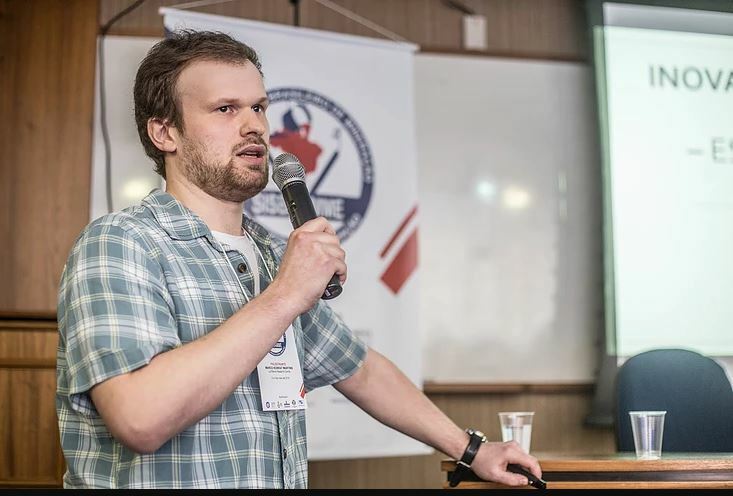 The contribution from research, education and industry showed by the presentations made an overall picture of the current state and advancements of mining exploration and provided a look into the future. 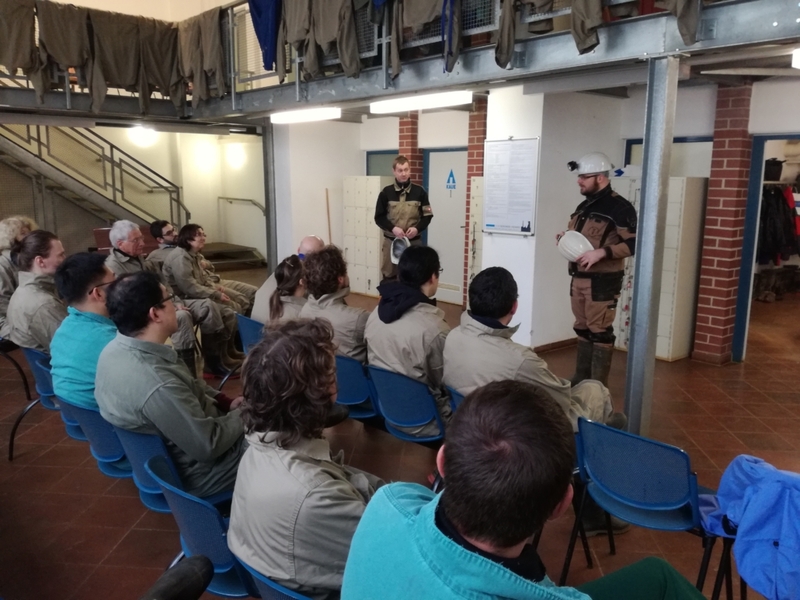 In total, the UNEXMIN personnel gave four talks during this day. 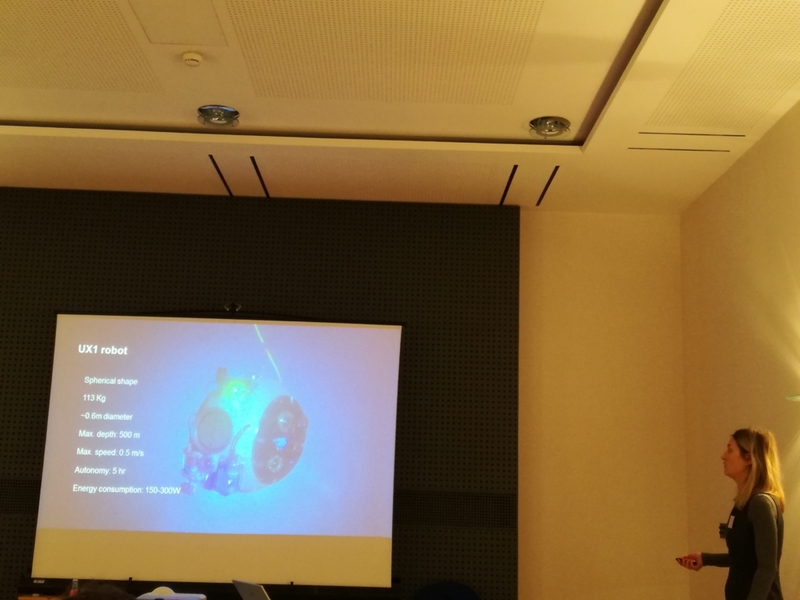 From LPRC, Luís Lopes presented the current state of the UNEXMIN project, as of March 2019. 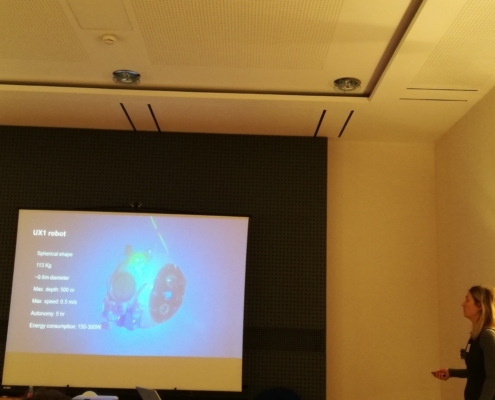 The presentation was well received and gathered a lot of interest in the project and to the more technical presentations that followed. 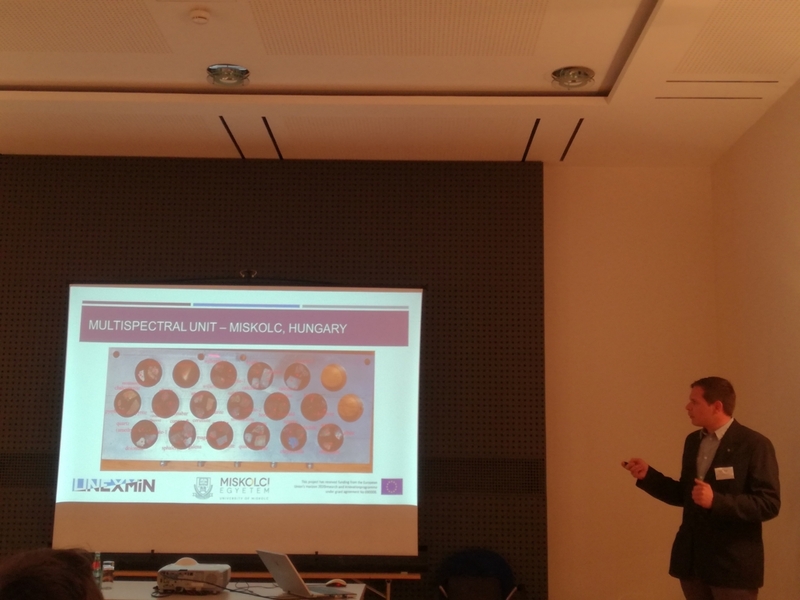 Then throughout the day, presentations on the multispectral camera and its data, 3D mine mapping tools and findings of the field trials, were given by partners University of Miskolc, INESC TEC and Geological Survey of Slovenia, respectively. 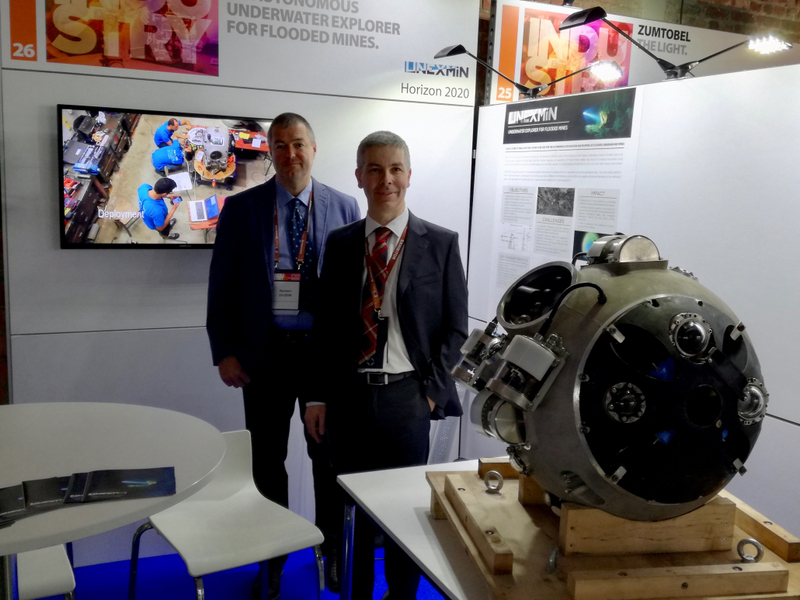 By the end of the conference the UNEXMIN team left with a sense of duty accomplished. 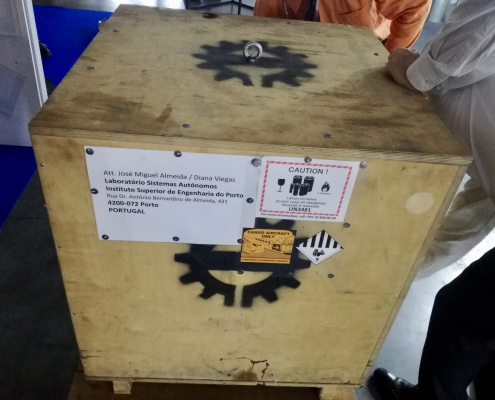 The project was communicated to a wide range of stakeholders and interest in the project was, once more, raised. 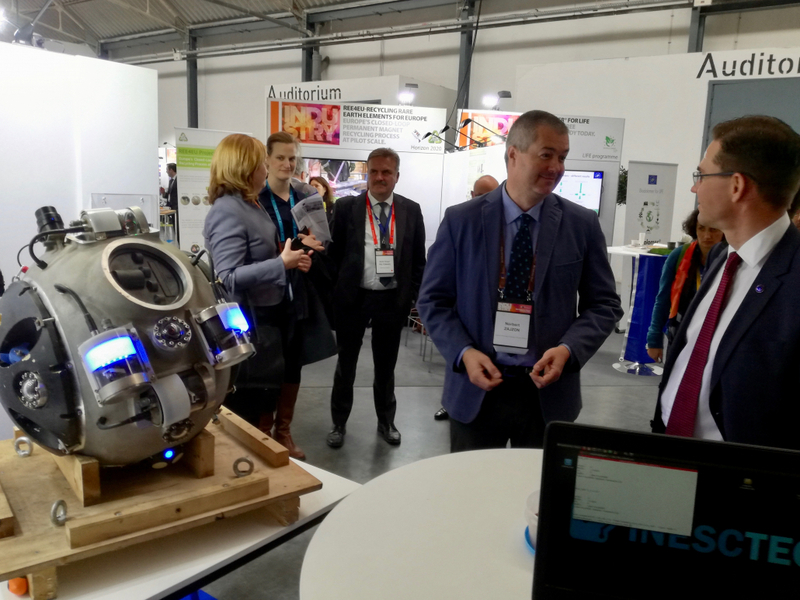 LPRC was proud to present the UNEXMIN project and to contribute to discussions towards a more innovative European raw materials future. 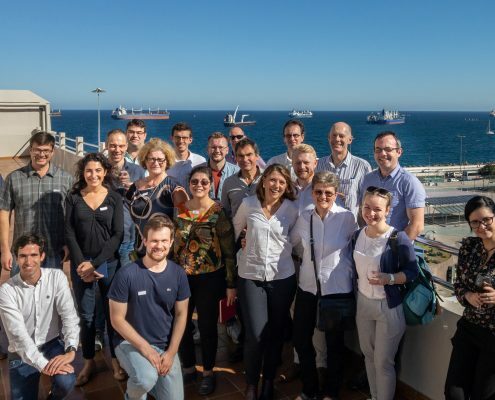 LPRC organised the CHPM2030 Roadmapping Workshop in Las Palmas as a follow-up of the previous Visioning workshop, under WP6 – Roadmapping and preparation for pilots. 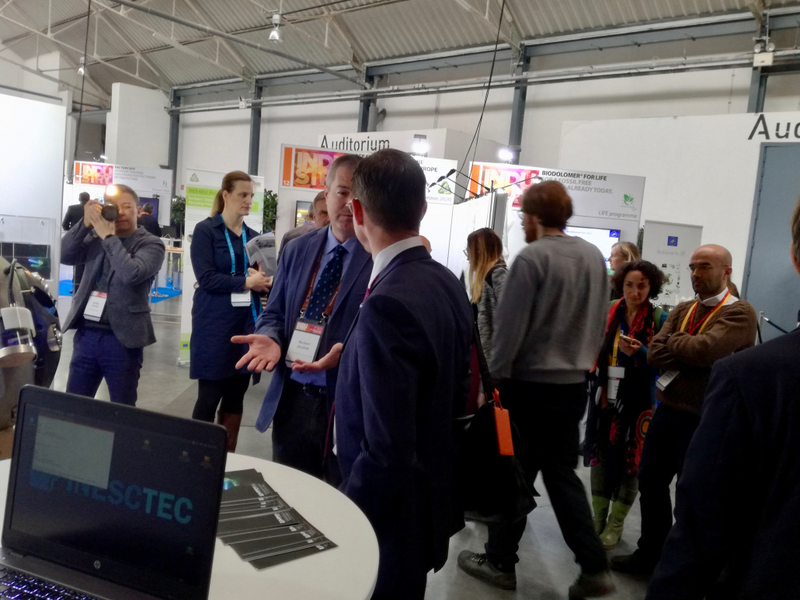 The participants were selected from both Consortium members and external research centres and companies from the geothermal and mineral sectors. 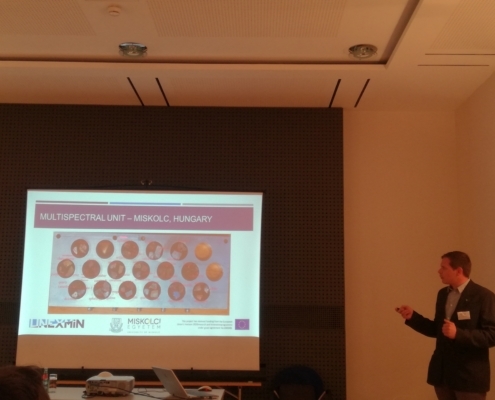 After the introduction presentations from Tamás Madarasz: CHPM2030 State of the art, Tamás Miklovicz: WP6 context, and Marco Konrat: Roadmapping methodology, the main tasks were the validation of previously identified targets (vision), and the backcasting exercise itself. The targets are related to two distinct time horizons: 2030 pilot level (TRL 6-7), and 2050 full scale application (TRL 8-9). 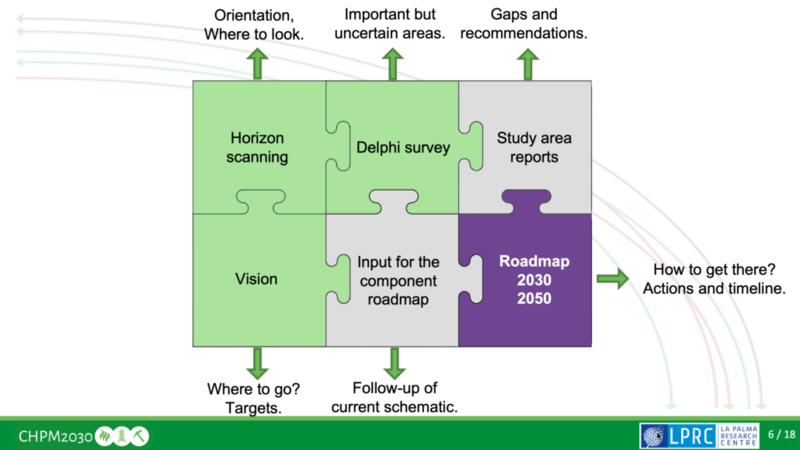 The sum of the targets is the vision description, and it is formulated as the desired end-state to arrive by 2050. 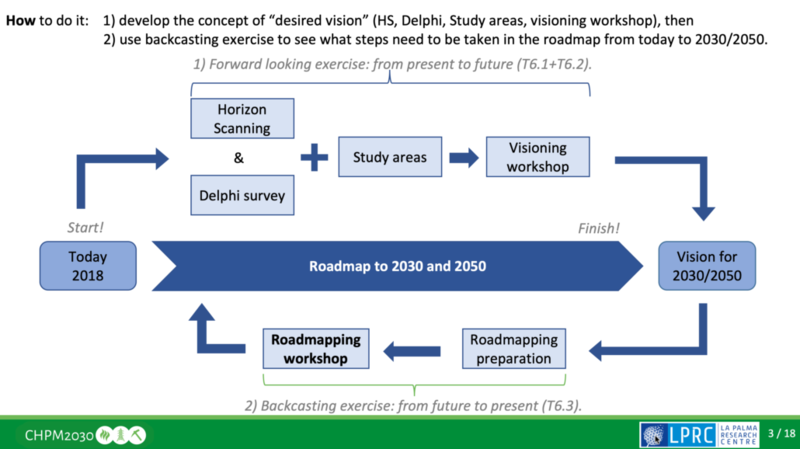 The proposed targets were delivered at the Visioning workshop with the use of the results from the Delphi survey, and the Horizon Scanning exercise. 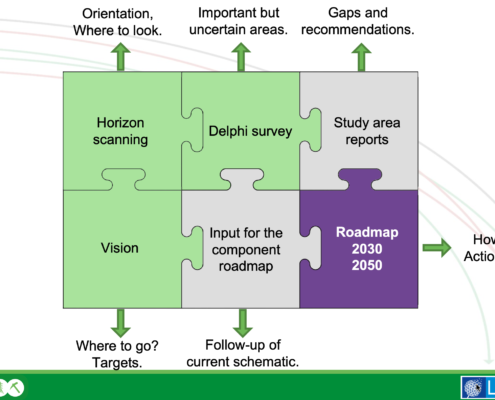 In short, the Vision describes where to go (targets) and the Roadmap outlines how to get there (actions + timeline). 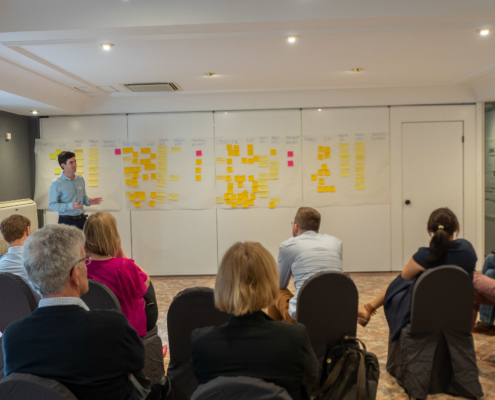 The backcasting exercise allowed the CHPM team to investigate how to reach the goals and what actions and paths need to be taken and pursued. 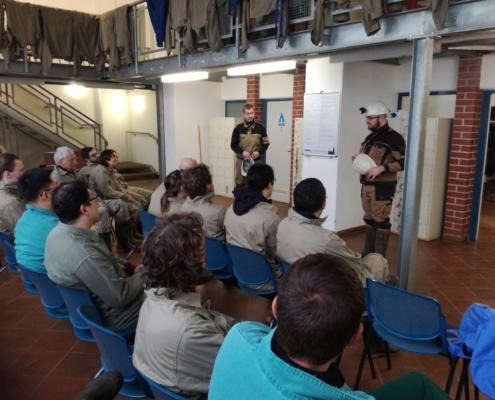 Whenever investigating a target, the group considered three aspects, when formulating the actions: 1) underlying research & knowledge, 2) capabilities, performance & technologies and, 3) partnership and actors. 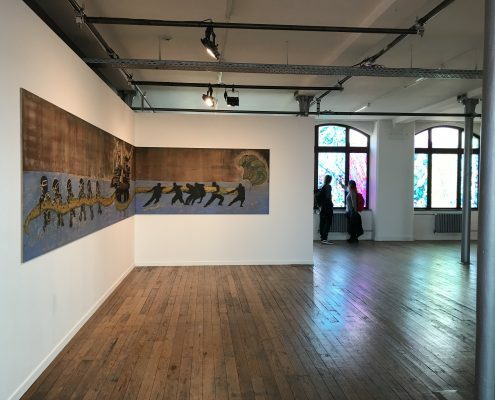 When thinking about the long term targets in 2050, “wildcards”, unexpected disruptive events that may influence reaching the vision, were also considered. 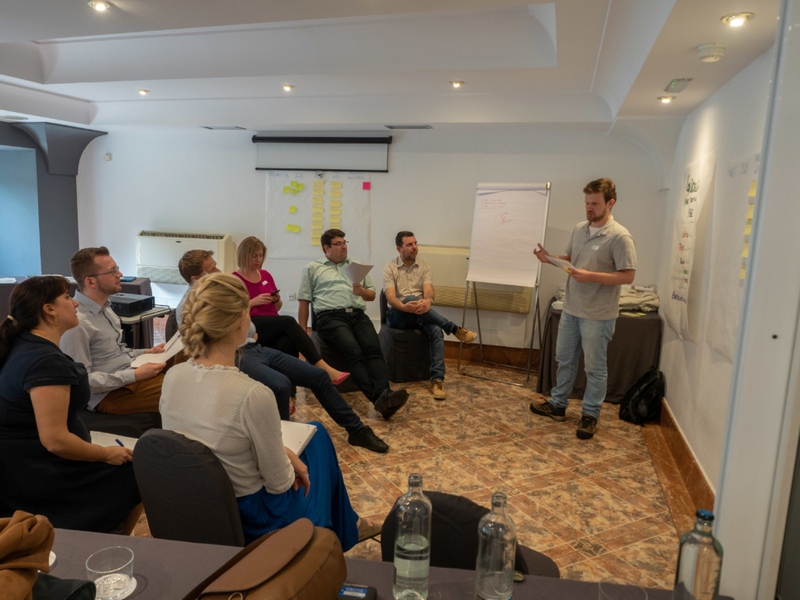 The participants were split into two parallel groups for the sake of the exercise: development and exploration, and operation and market, facilitated by Tamas Miklovicz and Marco Konrat, respectively. 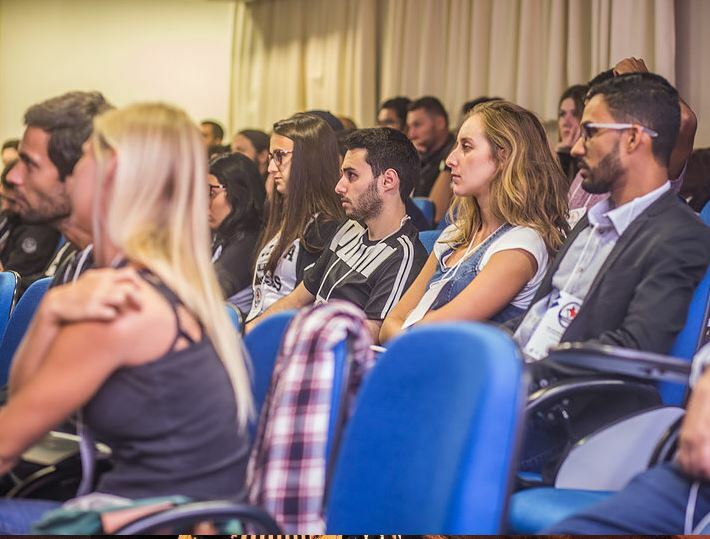 At the last session, all participants came together and the group facilitators presented the results from the previous two sessions. 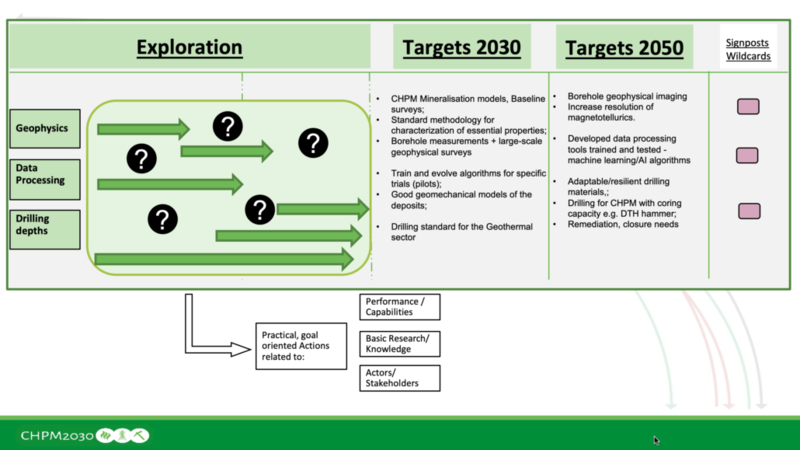 This line of activities will be only one layer of the final CHPM2030 roadmaps. 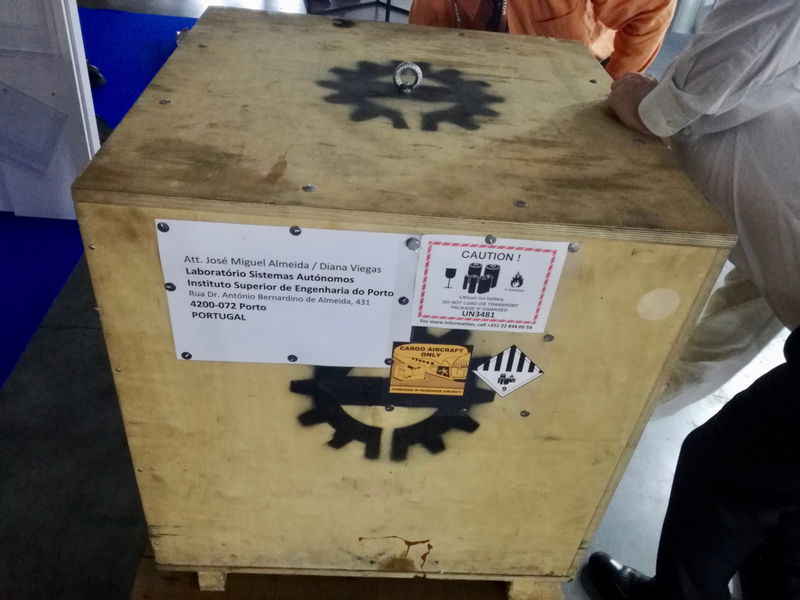 This particular aspect is testing the overall concept of the cross fertilization of the geothermal and mineral industries. 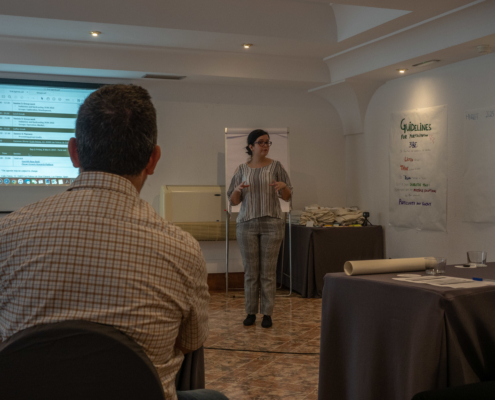 The second layer consists of investigating concrete areas for CHPM application and providing gaps and recommendations at four EU study areas in Sweden, UK, Portugal and Romania. 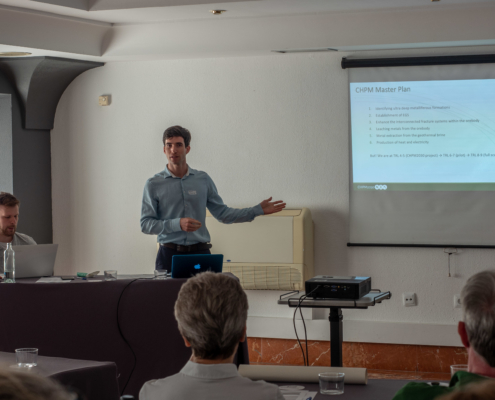 The third layer is the direct followup and research plan of the current technological components of the CHPM scheme. 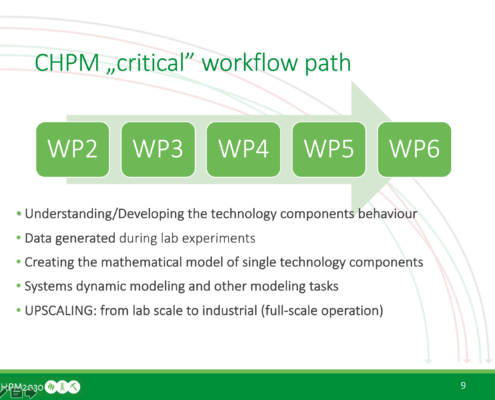 When put together, these elements will make up the final Research Roadmap for the CHPM technology. 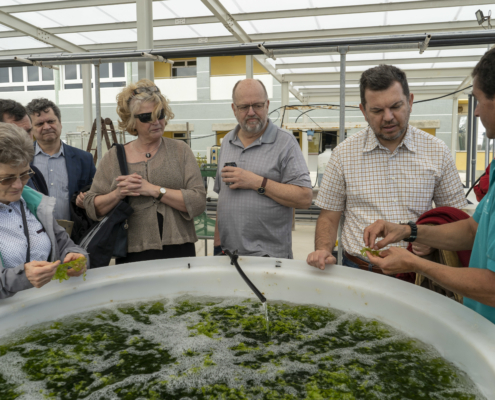 During the second day, the participants visited the Spanish Bank of Algae, as part of a field trip The facility provides many services, including the bank of microalgae and cyanobacteria strains, genomic DNA bank, algal biomass production for industry, production of seaweed extracts on demand for companies in the biotechnology sector, analysis of samples for the determination of algae, deposit and maintenance of strains for registration of industrial property. 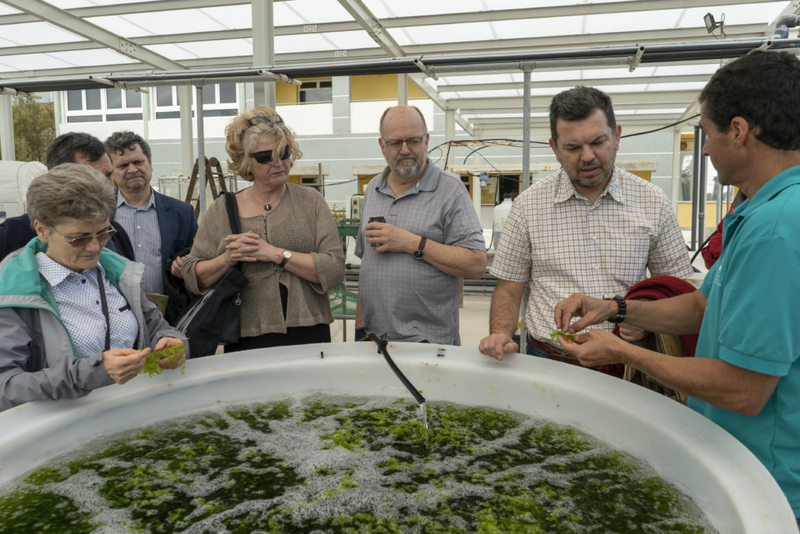 More than 2000 algae strains are stored in the algae bank and many interesting research activities were presented to the group. The next stop was PLOCAN, the Oceanic Platform of the Canary Islands. 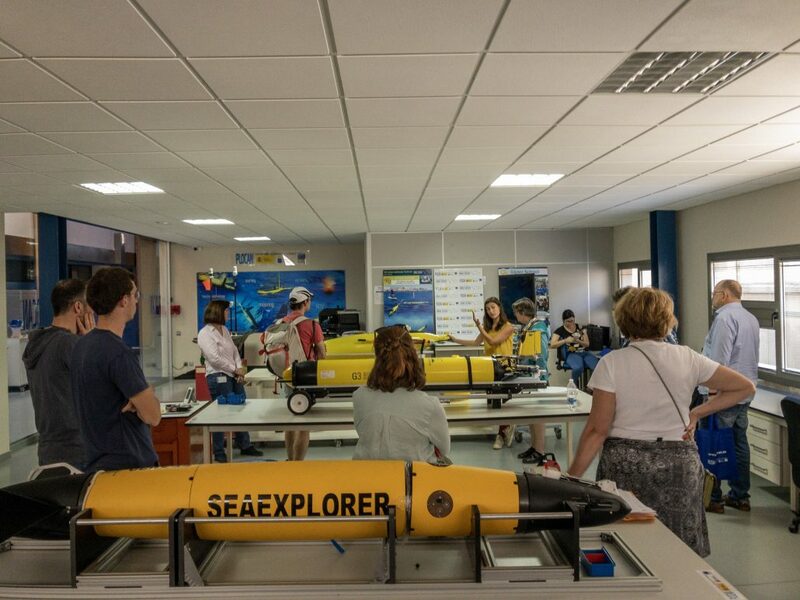 The guided tour included a presentation of the ongoing activities and research of the infrastructure and a visit to the control room and laboratories with ROVs, sailbouys and submarine autonomous gliders. 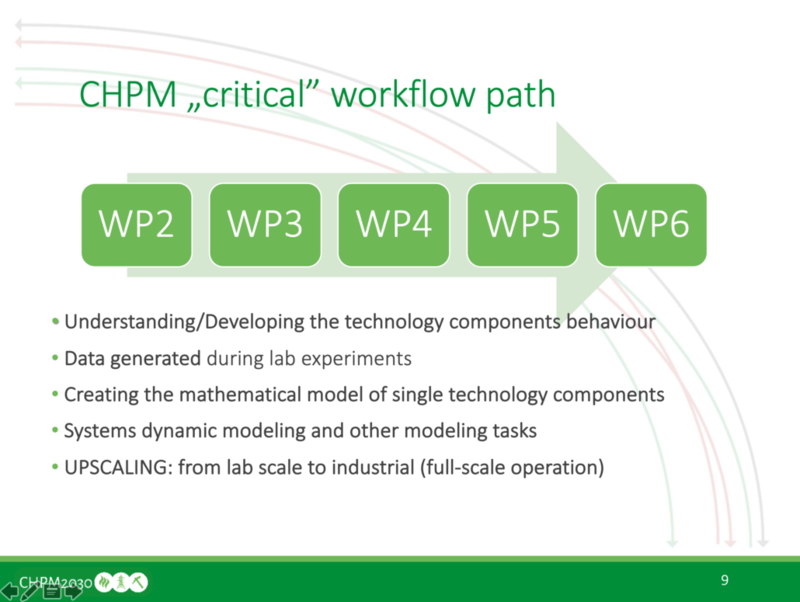 The LPRC team will now take these new input and start drafting the roadmaps for the CHPM technology in the future! 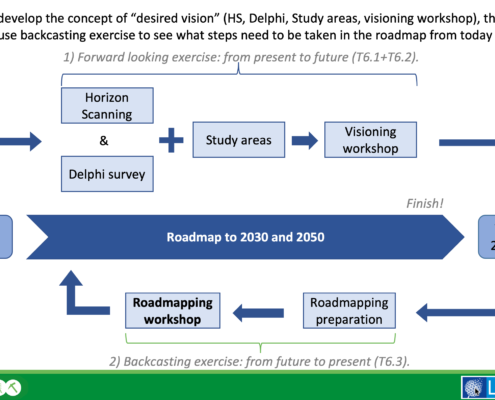 We will present the roadmap at the final conference in Delft, and it will be finalised later in June! 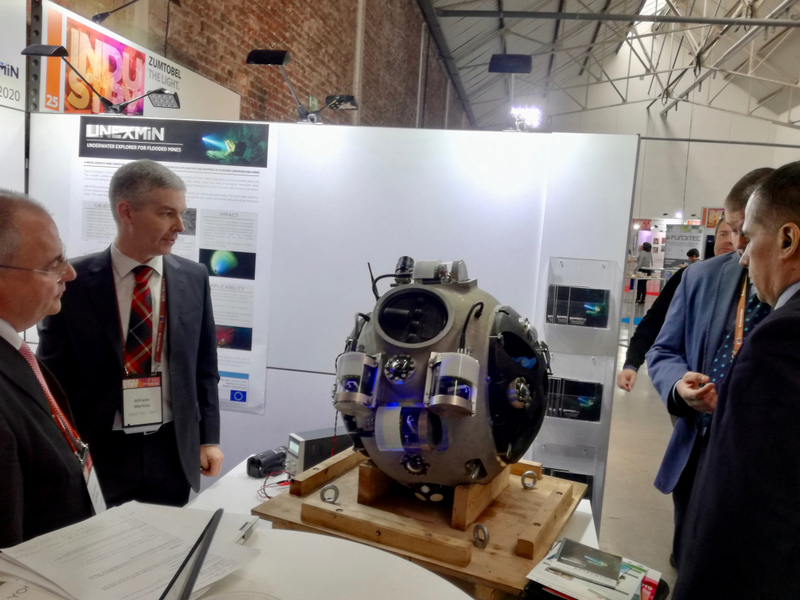 The UNEXMIN project was present at the EU Industry Days 2019 in Brussels. 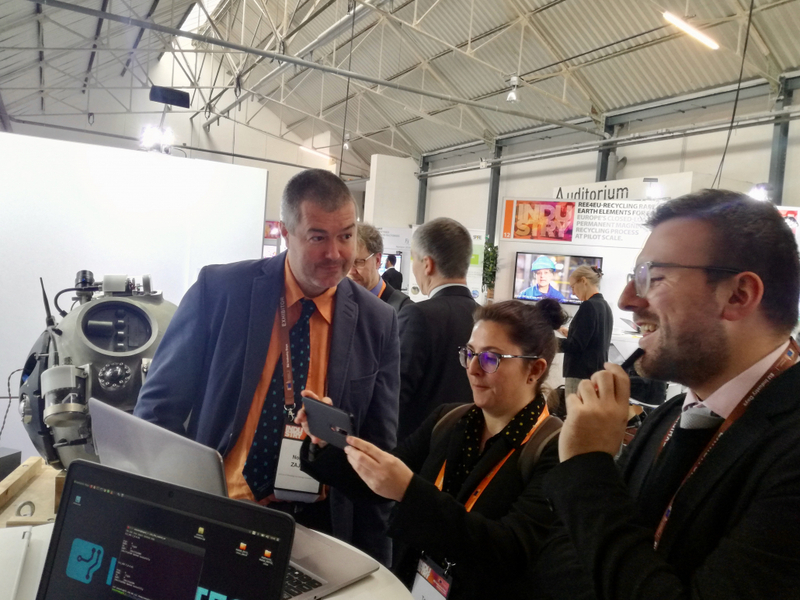 The event, during the 5th and 6th of February, brought together many stakeholders from the most diverse industrial sectors within Europe and beyond, also including researchers and governmental bodies. 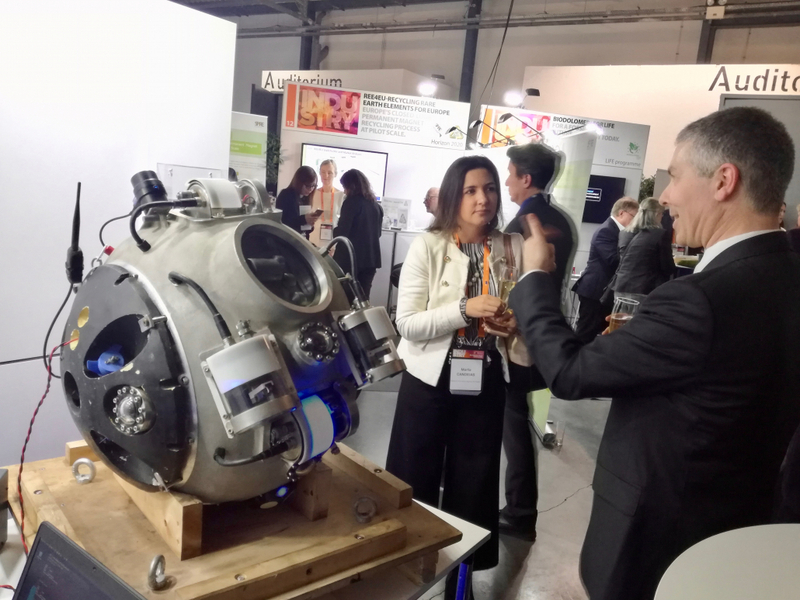 Some European funded projects were invited to showcase their innovations and impact in the EU industry landscape. 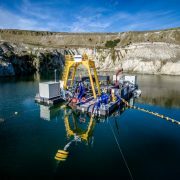 This was the case for UNEXMIN. 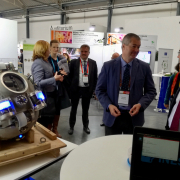 During both days of the event the UNEXMIN project booth conveyed a lot of interest from the participants that visited the exhibition area. The UNEXMIN stand counted with three Consortium partner and one robot, the first UX-1 prototype. 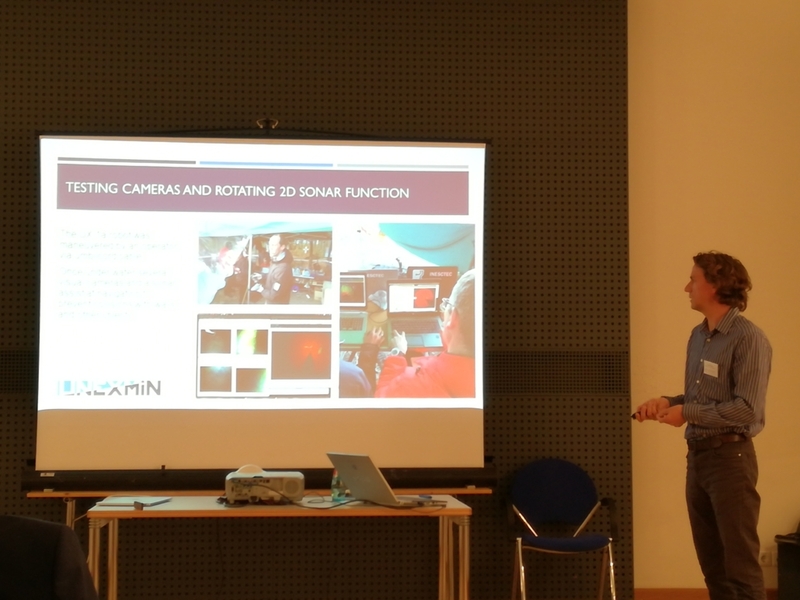 From La Palma Research Centre, Luís Lopes was present to help in communicating the project to a very diverse audience. 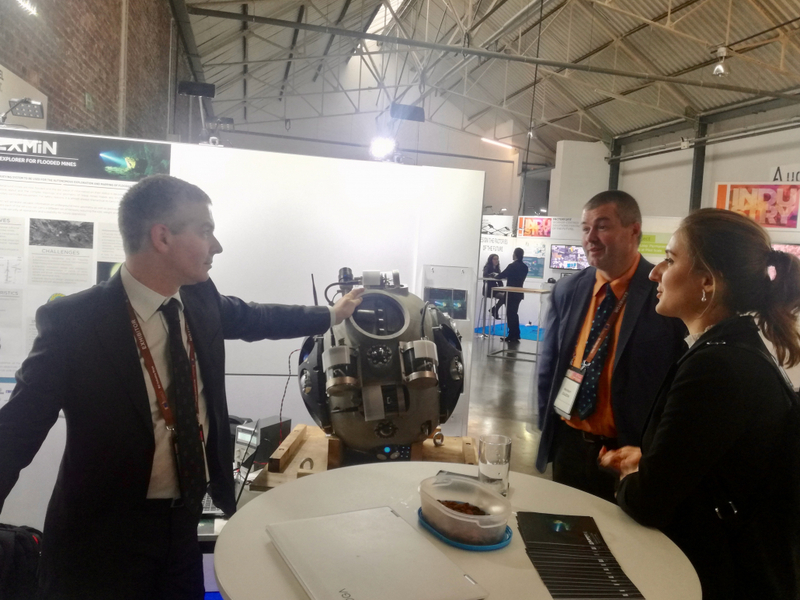 The presence of the UX-1 robot at the UNEXMIN stand surely invited people to come and discuss about the robot itself and the project overall. 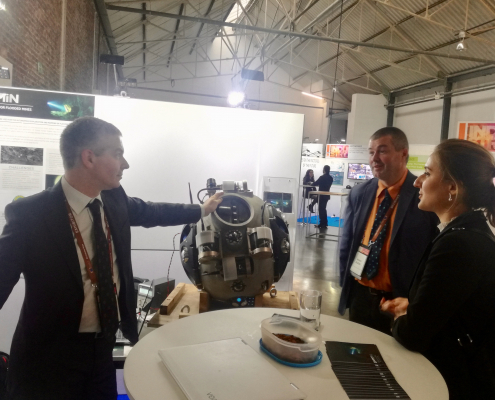 Past, present and future developments were among discussions as were some future commercial perspectives where the innovative UNEXMIN technology can be applied. 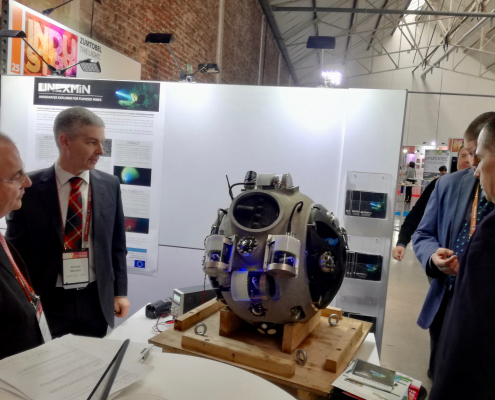 In the end of the event, the UNEXMIN team felt that this was a great opportunity to disseminate and communicate about the project and was very glad to be invited to such an important event. Mission accomplished! 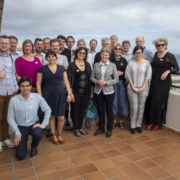 LPRC recently organised the CHPM2030 Visioning Workshop in Las Palmas. 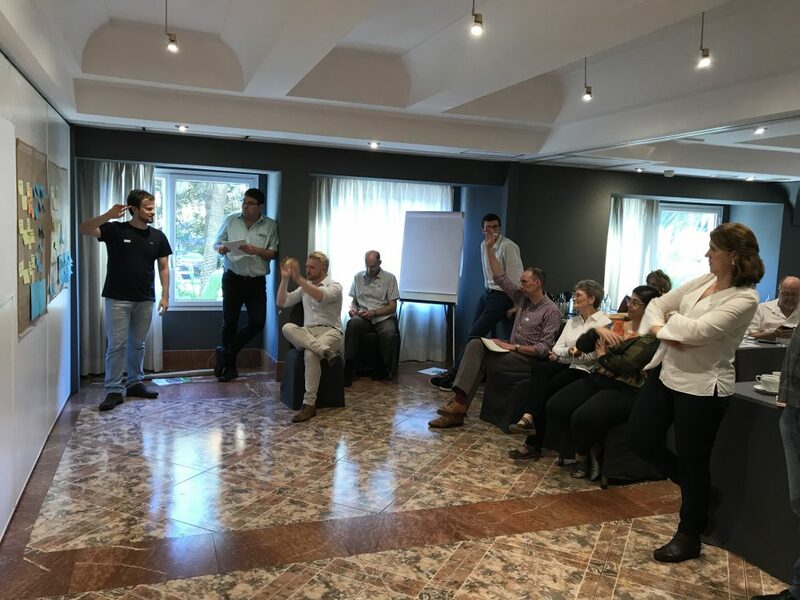 The participants were selected from both Consortium members, external research centres and companies from the geothermal and mineral sector. 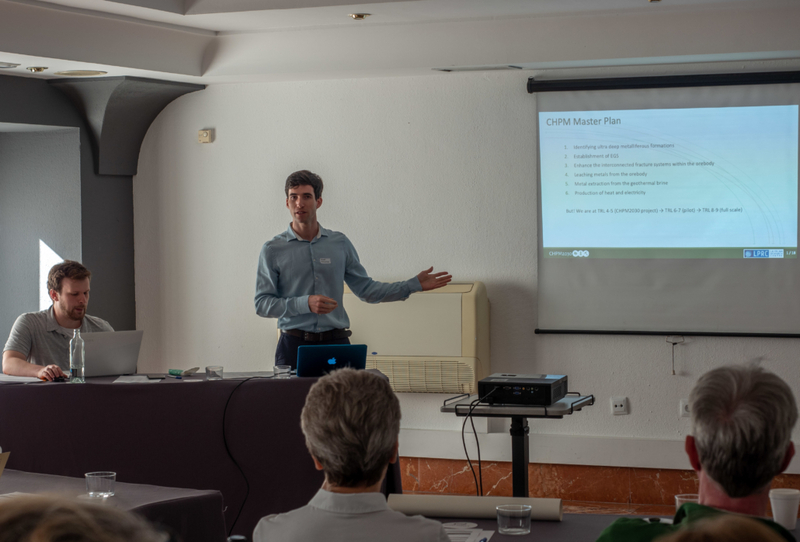 The workshop is part of the project’s forward looking exercise which is aiming to set the ground for subsequent implementation of the CHPM (Combined Heat Power and Metal extraction) technology in the future (2030/2050). 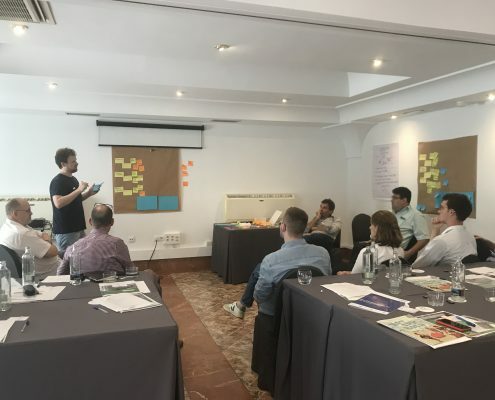 The goal of this workshop is to create a shared vision, clear picture, description about how the technology ideally evolves by 2030/2050 and set tangible/measurable targets for it. 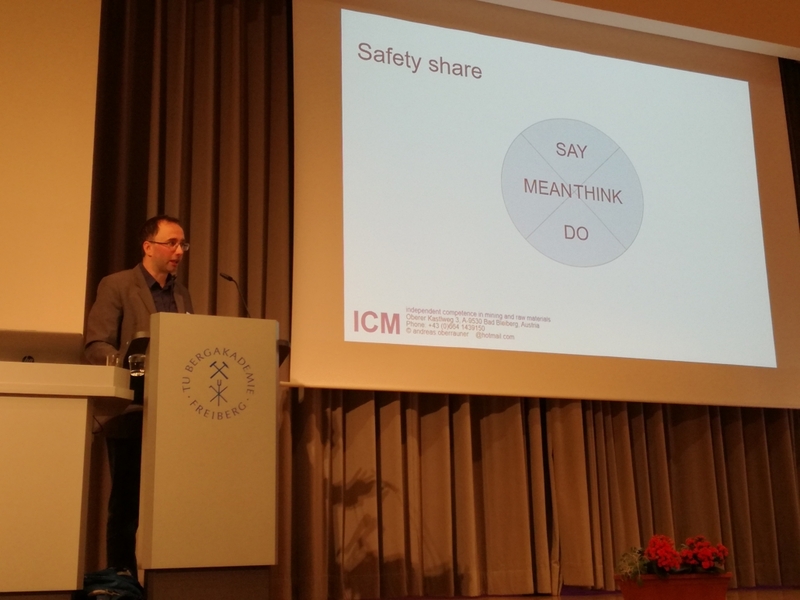 The workshop begun with introductory presentations (Tamas Madarasz: CHPM state-of-the-art, Tamas Miklovicz: WP6 context and Marco Konrat: Visioning methodology), to which the main exercise followed: the group discussion of given topics (eg. 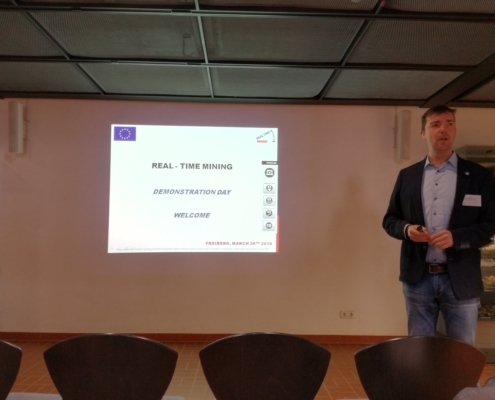 drilling) about requirements vs. achievability and targets that must be achieved before the CHPM technology can reach pilot level (TRL 6-7) by 2030 and full scale (TRL 8-9) by 2050. 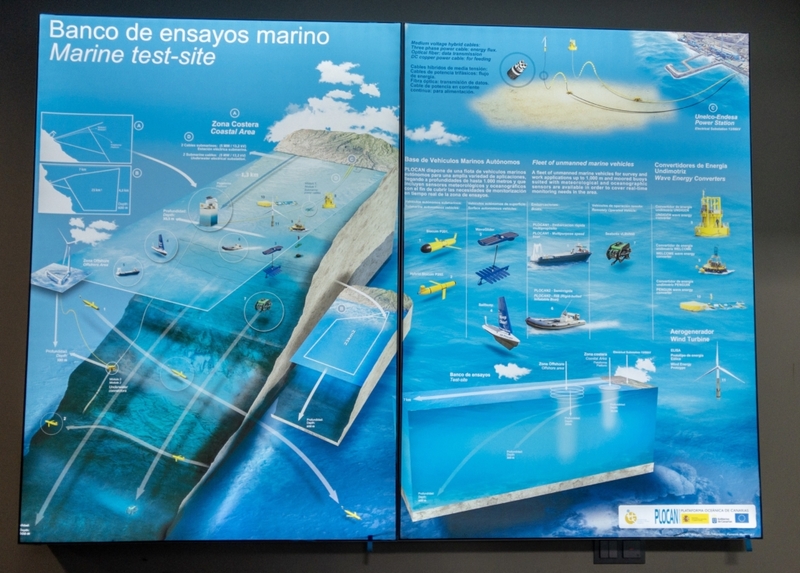 The different topics were grouped as exploration and market, development and operation. 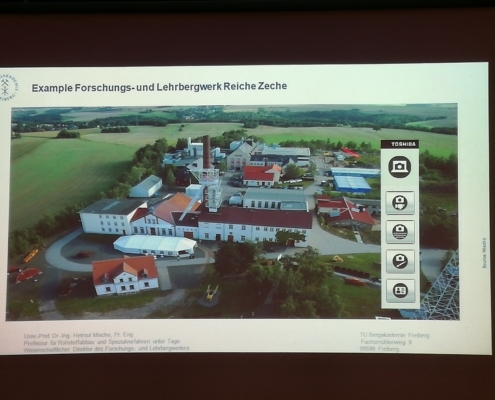 Each contained subtopics and issues that had emerged during the Delphi survey. 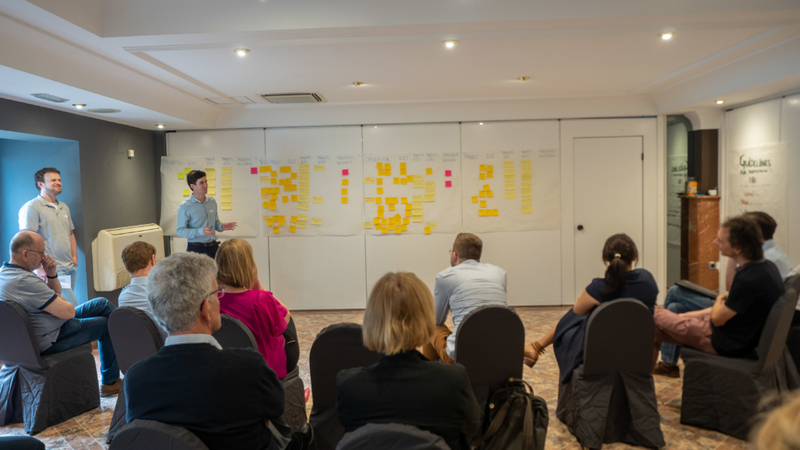 This was not a exhaustive list, and the participants added new issues or reformulated relevant ones during the group work. 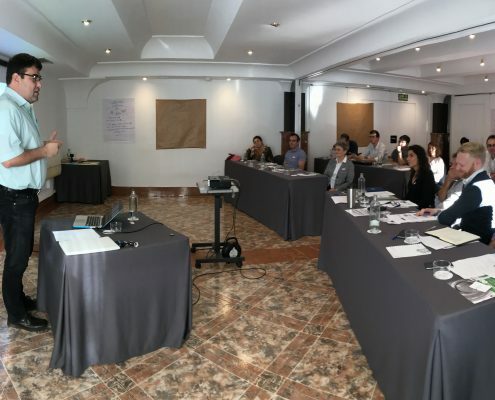 The aim of the group work was to set measurable targets at each relevant issue for 2030 and/or 2050 (eg. reduce drilling cost by 2030 within 30%). The sum of the targets is the vision for the given area. The last session was about consensus building. 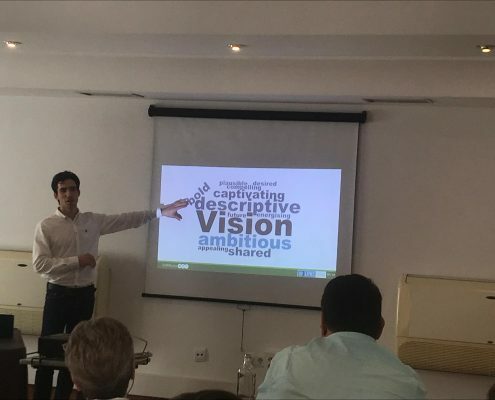 For this, the team brought all group visions together (per area, per time horizon) and created a shared vision for 2030 and 2050. There is still a lot post-processing to be done, but the work will now continue with fresh ideas and new input. 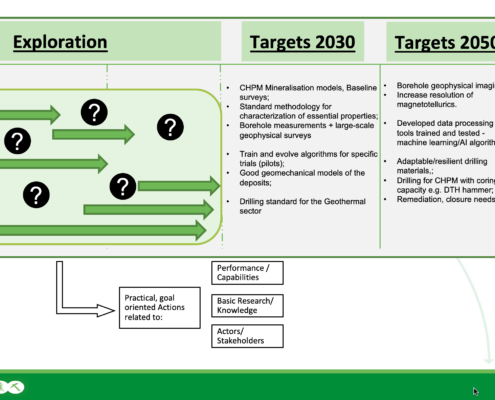 The CHPM 2030 and 2050 roadmaps will be based on this vision and will outline actions in order to meet the proposed targets and arrive at the desired future. 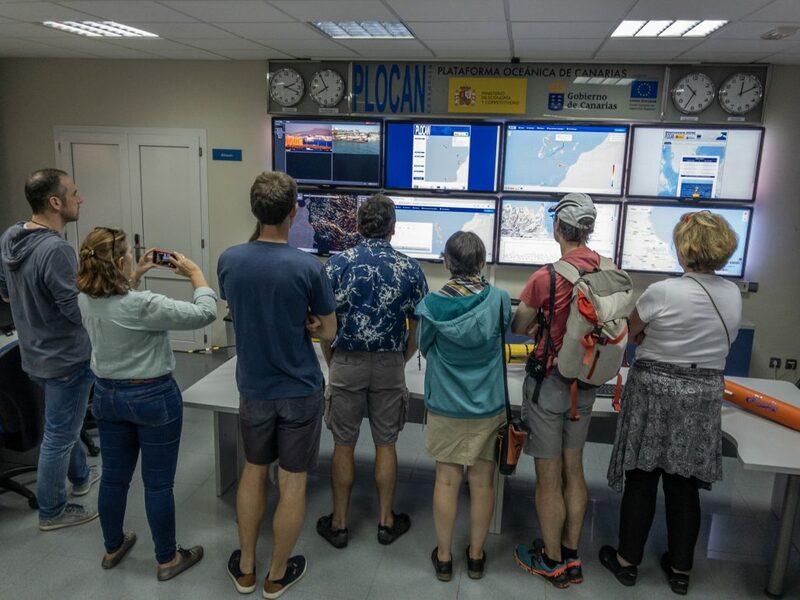 On the second day, the participants visited PLOCAN‘s oceanic research platform. 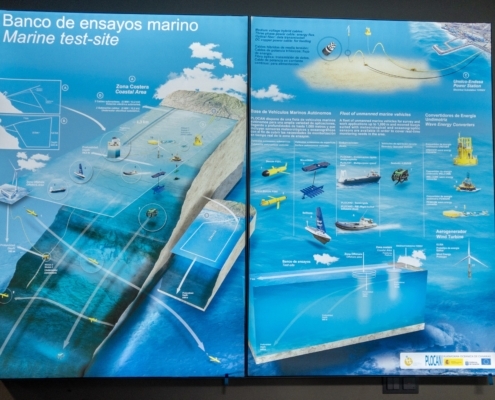 The Oceanic Platform of the Canary Islands (PLOCAN) is a Research Infrastructure (RI) labeled by the ICTS (Unique Scientific and Technological Infrastructure) Spanish National Roadmap. 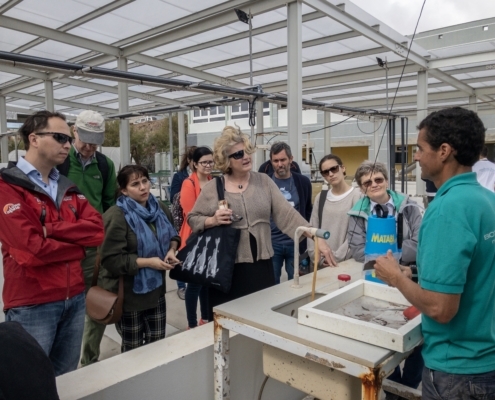 The visit covered a boat trip to see the offshore platform, and a presentation at the onshore laboratories about the ongoing PLOCAN research and blue economy of the Canary Islands. 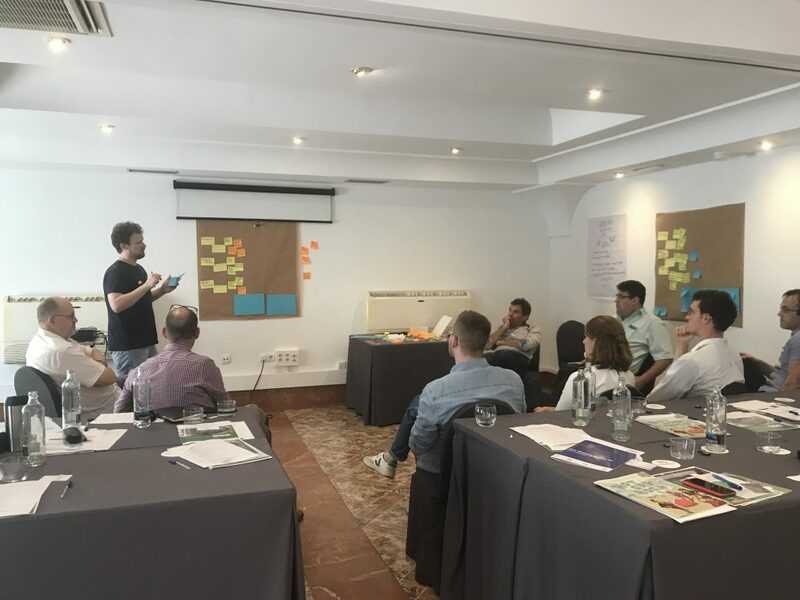 The work will continue with processing of the workshop results, and prepare the Vision for the Roadmapping activities in early 2019! 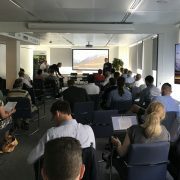 LPRC attended to BIOMOre, a H2020 funded project on an alternative mining concept, final event on last Friday, 6th of July, in Brussels. 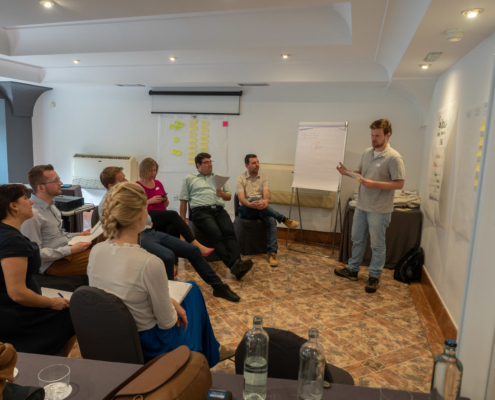 The event facilitated discussions between project partners and participants on BIOMOre’s main goal: extracting metals from deep mineralized zones in Europe by coupling solution mining and bioleaching. 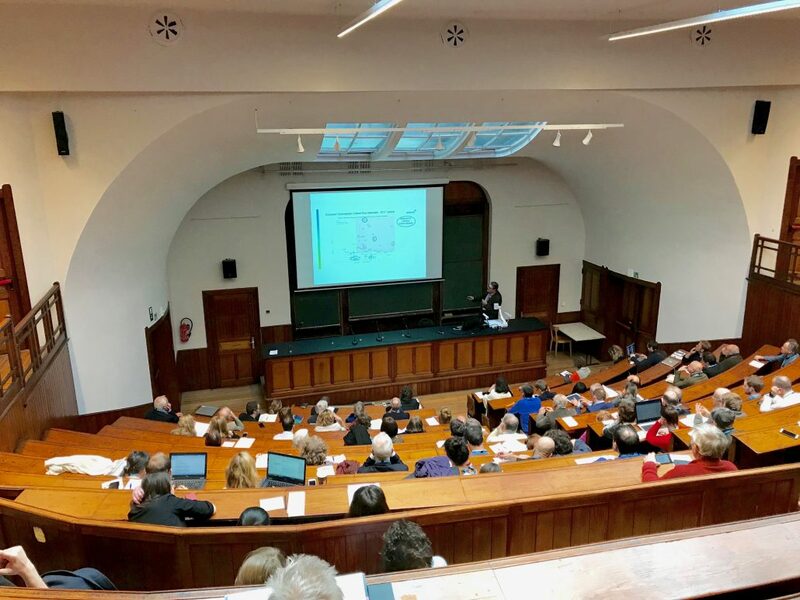 The conference started with the presentation of the project by the coordinator, followed by two keynote presentations on the topic of raw materials. 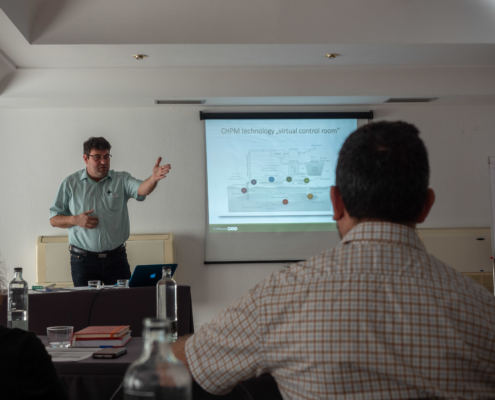 First, Massimo Gasparon, from the EIT Raw Materials, talked about the EU raw materials dependence, the need of these materials for the transition to the green economy, the EU Raw Materials Initiative, and the Knowledge Innovation Communities. 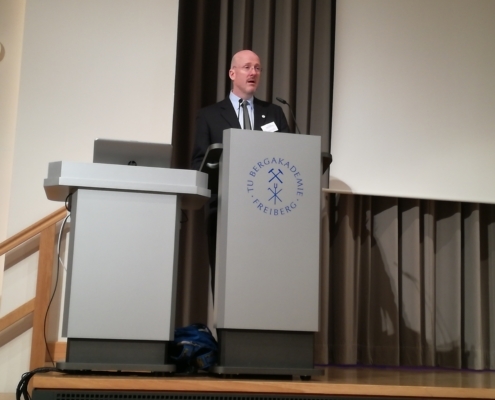 The second presentation was by Bjorn Debecker, from the EASME, and explained how the EU is tackling the raw materials challenge, through funding project like BIOMOre. 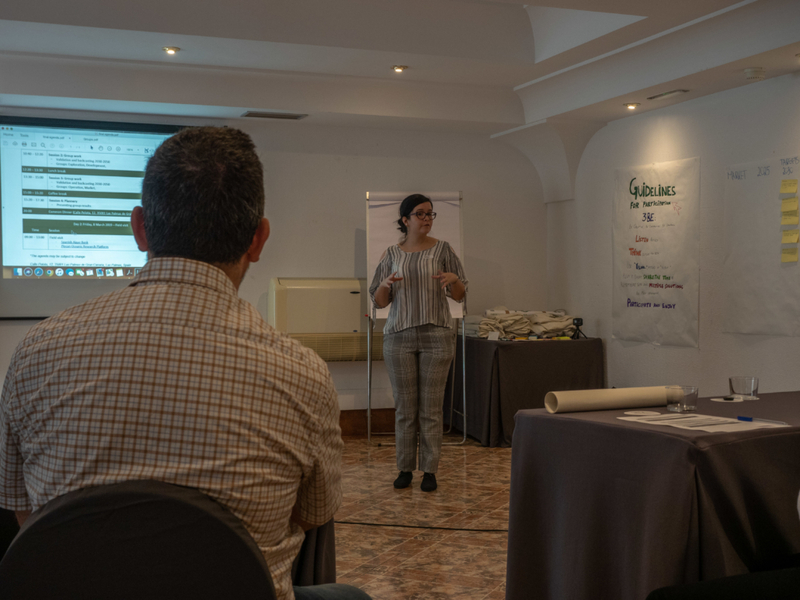 The afternoon session was based on BIOMOre-themed talks with the Work Packages leaders introducing the project in further detail: mining, bio-leaching and sustainability were amongst them. 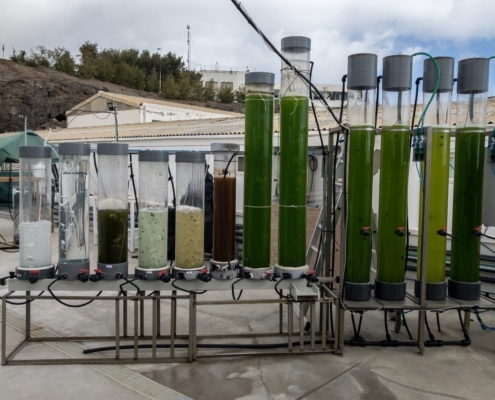 The BIOMOre project has been working on a New Mining Concept for Extracting Metals from Deep Ore Deposits using Biotechnology. 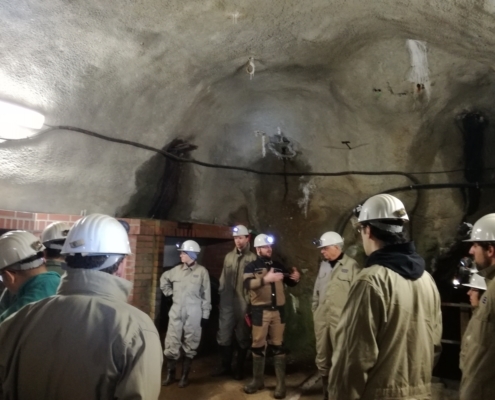 The final objective is to develop an optimized technological concept for in-situ recovering of metals from the surface, without the need of establishing an underground infrastructure. 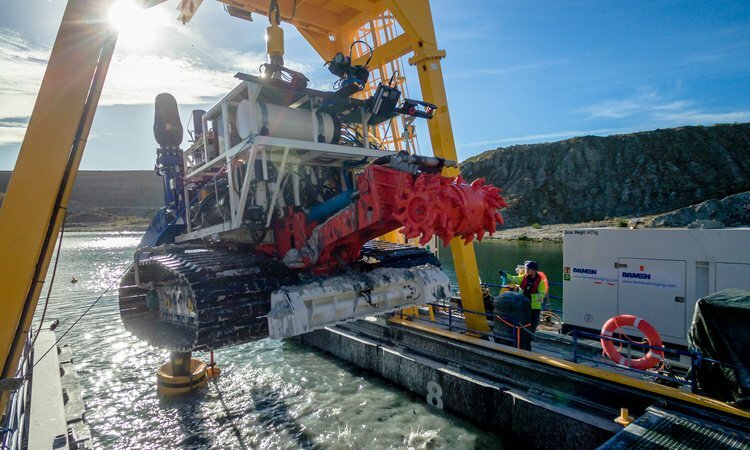 This technology, if successful, will make commodities accessible at depths greater than 1,500 m ( and temperatures around 50 – 60 ºC) which are currently not exploitable using traditional underground methods. 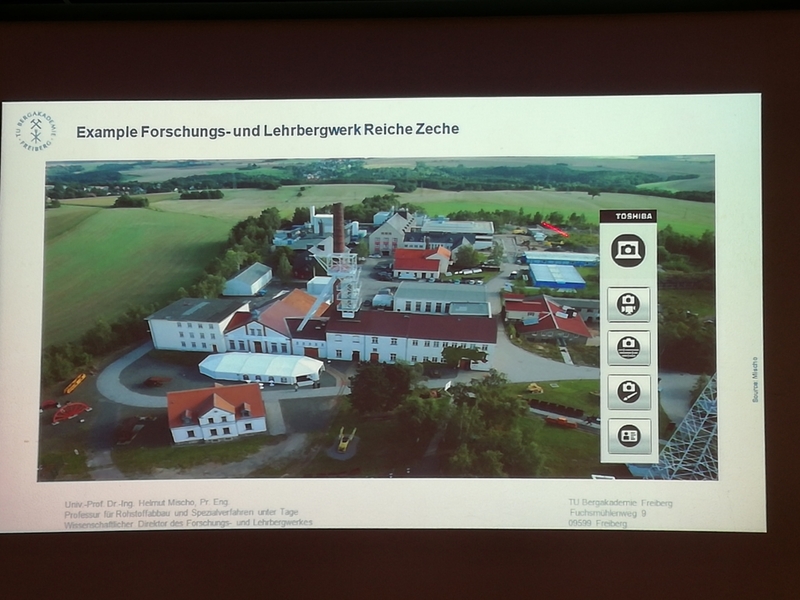 Watch the movie to learn more about the project concept. 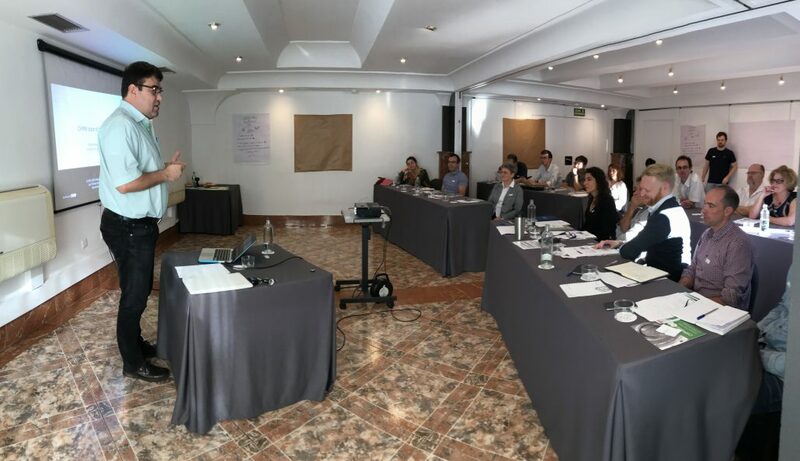 On the 27th of June, LPRC attended a conference based on the litium value chain. 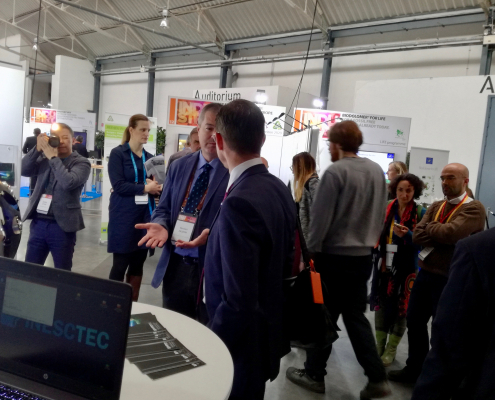 The event entitled “Building the lithium value chain in Portugal” brought together stakeholders and other interested parties in the theme, and LPRC was amongst them. 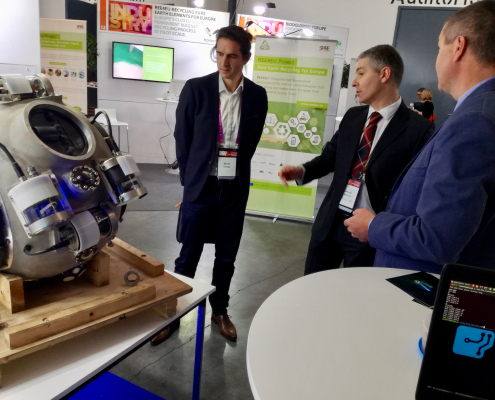 Lithium is quickly becoming a crucial element for modern society: it leads the electrification of transport and energy sectors, needed for the necessary changes towards a carbon neutral society. 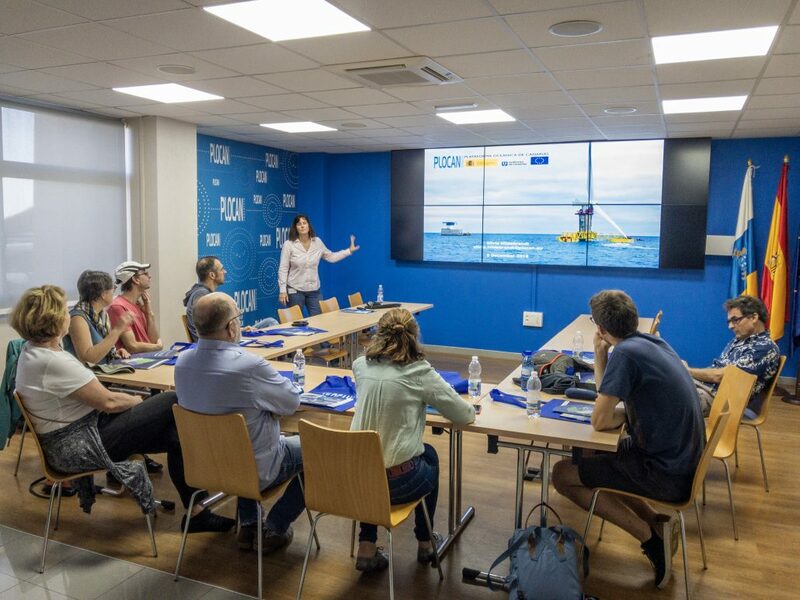 This was acknowledged by European responsible persons from the Portuguese and European institutions such as the DGEG and DG Grow, respectively. 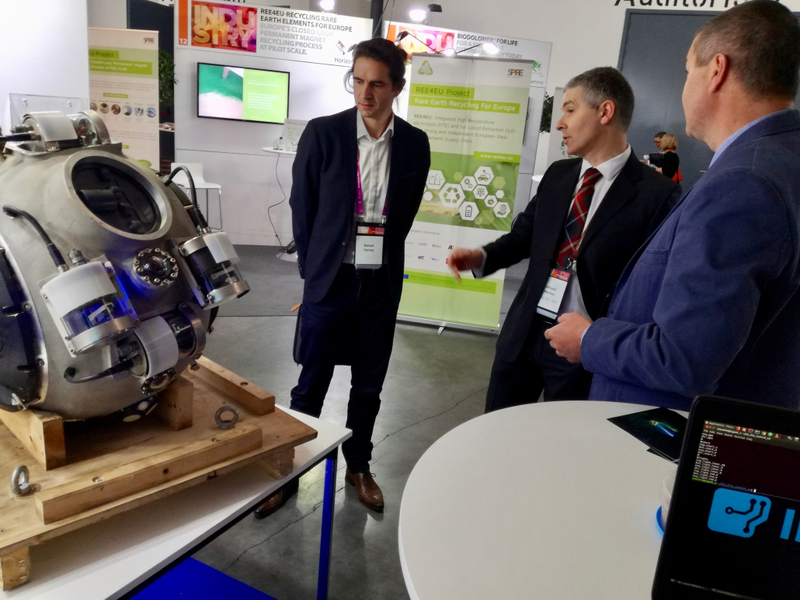 In order to push for a greener, more sustainable community, the EU needs to foster the entire value chain of lithium, from mineral prospection to recycling, with the circular economy concept as a goal. 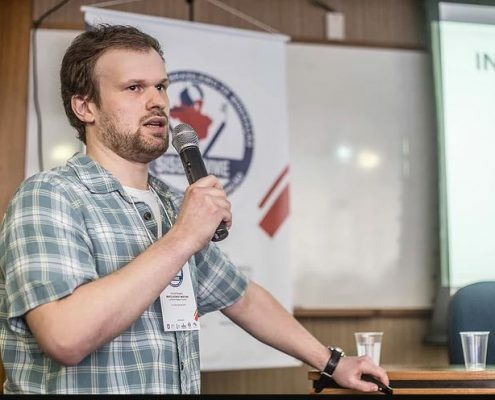 Many stakeholders including exploration and processing companies, and users of lithium as a final product such as Tesla and Umicore had talks regarding lithium during this event. 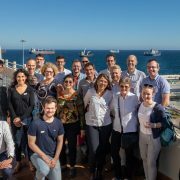 One of the main points arising from discussions is that lithium is a very important and strategic element for the future, and Portugal, as well as other European countries, has the potential to explore lithium resources that can make Europe lead the electrification revolution in the near future. 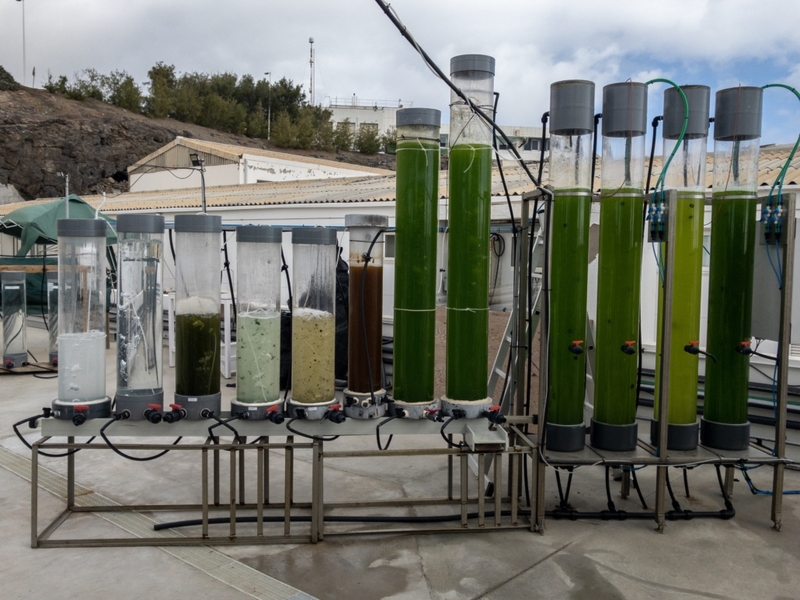 However, there needs to be a lot of effort to improve the current processing technologies, if Europe wants to take full advantages of its natural resources. 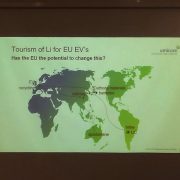 To support this view the EU has already created groups to deal with batteries and lithium related products issues and will invest more in research and innovation in this field. 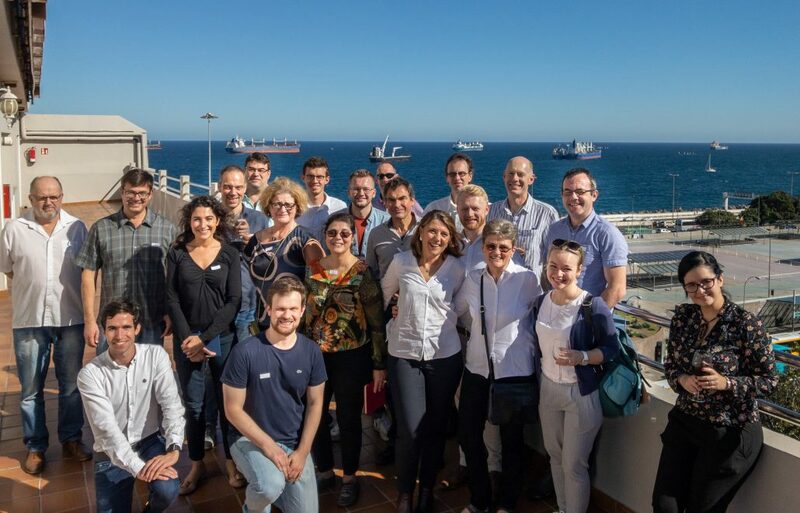 The future of lithium in Europe is bright, but there needs to be a common effort from stakeholders to make it happen coupled with a continuous look into the near future. 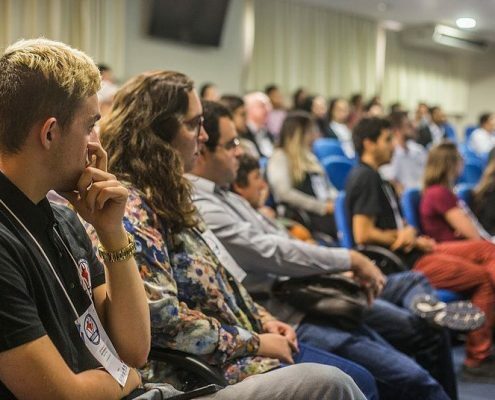 On May 3, LPRC joined the 2nd SISBRAMME (South Brazilian Mining, Metallurgy and Exploration Symposium) held at the Federal University of Rio Grande do Sul (UFRGS) in Porto Alegre, Brazil. 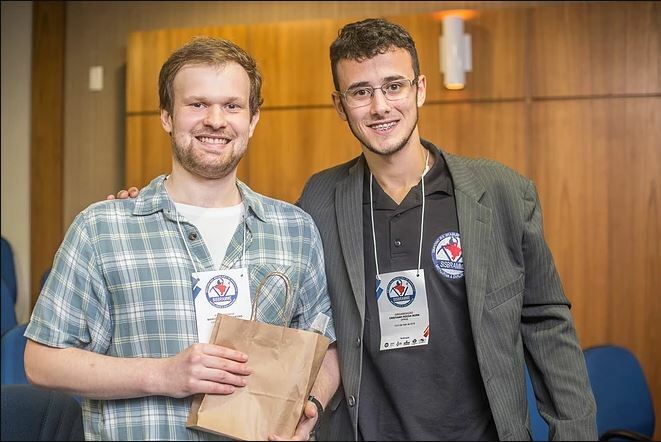 This annual event is a joint effort from both the local SME (Society for Mining, Metallurgy and Exploration) and the SEG (Society of Economic Geologists) student chapters. 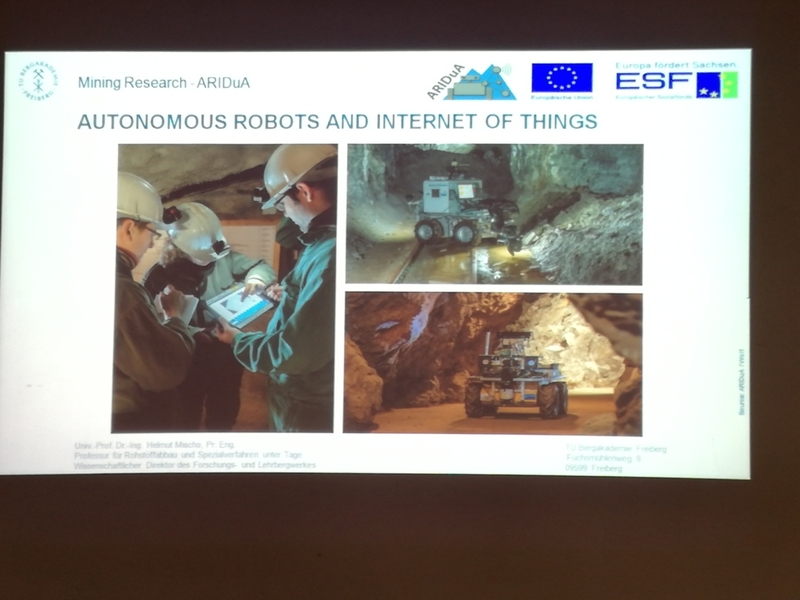 The 2018 edition’s theme was “Base Industries” and LPRC brought in a presentation entitled “Technological Innovations in Mining – Case Studies in Europe”, providing an overview over the portfolio of projects the company has been involved in recently and also the European context for research & innovation in the mineral raw materials sector. 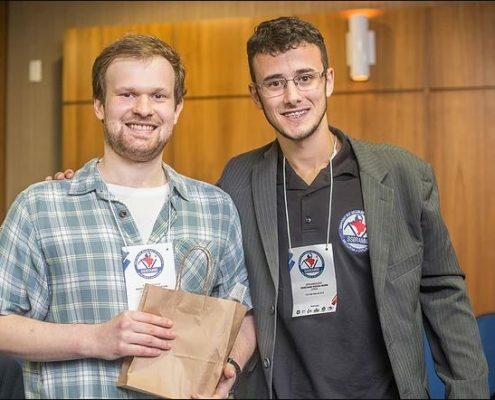 The event was attended by students, professors and local industry representatives. 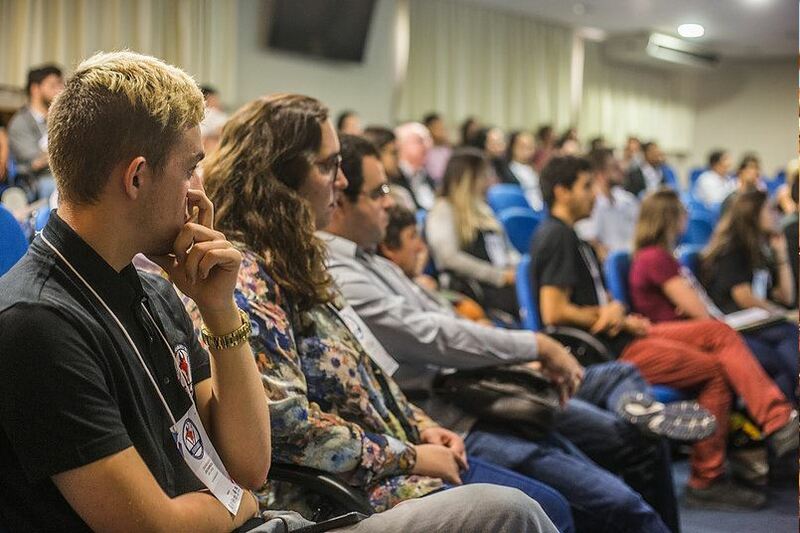 The region of south Brazil is currently experiencing a renewed interest in mining through advanced projects (Phosphate and Zinc), prospect of new ones (Nickel and Gold), deep-sea mining and socio-political debates over environmental impacts and the future of local coal mining. Our Foresight expert and representative Marco Konrat Martins underlined the importance of Foresight as a powerful tool to help researchers, policy-makers and industry to deal with the diversity of expectations and the uncertainties stemming from mineral resources exploitation. 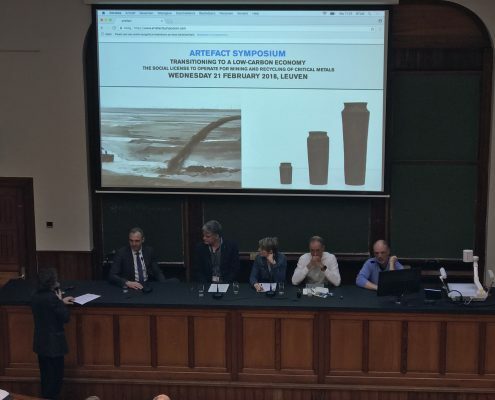 On the 21st of February, a symposium took place in Leuven, and LPRC was present. The event focussed on the thematic of Transitioning to a low-carbon economy and the social license to operate for mining and recycling of critical metals. 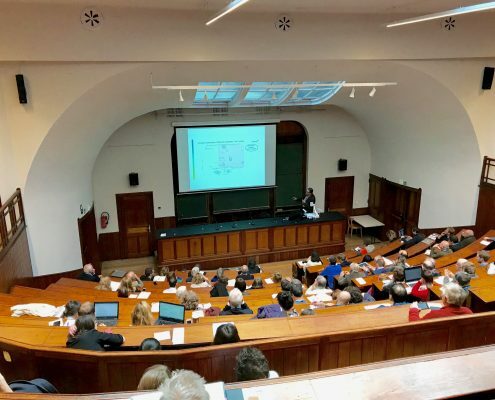 The symposium elaborated on the paradox of the “Importance of critical metals for the transition to a low carbon, cleantech-based economy versus the not-always-so-positive image of the primary mining industry”. 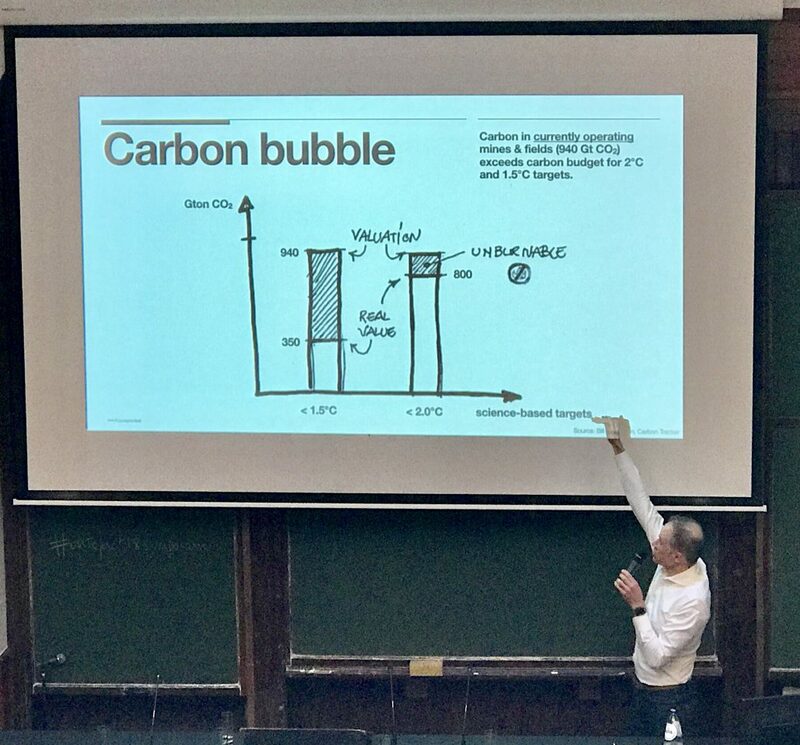 On one hand, Europe undoubtedly needs critical metals for the transition to a desired low carbon, cleantech economy – however, it is import dependent regarding most of the metals, needed to reach this transition. On the other hand, society often has a negative image on mining, since historical extraction gave mining a bad name. 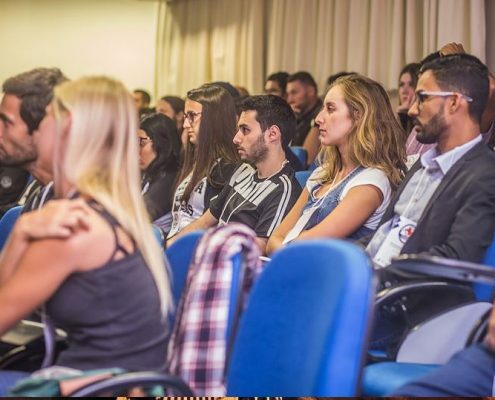 The members of the audience, who were naturally divided into “social” and “technological” groups, had a passionate discussion about this topic and its implications to society. 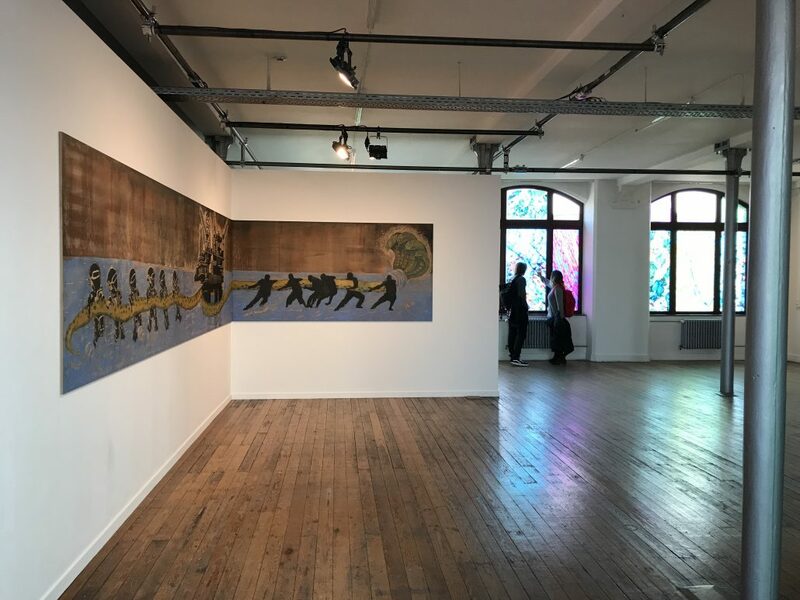 This shows that dialogue is crucial, and not only that, but also opens minds too, in order to arrive to a common understanding between different stakeholders. 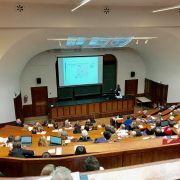 The symposium opened with two introductory talks. 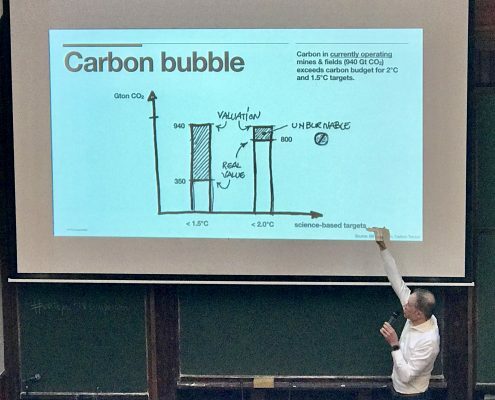 The first keynote was from Serge de Gheldere (Futureproofed), who proposed business-led, sustainable solutions, resulting new businesses, reduced risks, better branding and lower costs. After the keynote speech, a panel discussion took place. 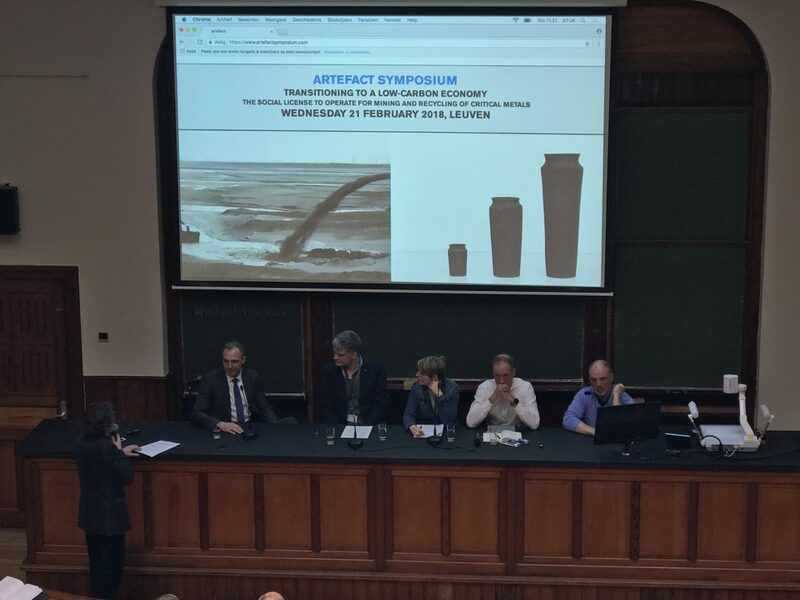 The afternoon session, begin with two keynote presentations from Egbert Lox (UMICORE) and Leida Rijnhout (Friends of the Earth Europe) presenting social and industrial viewpoints. The discussions continued with a panel and Q&A session with the audience. 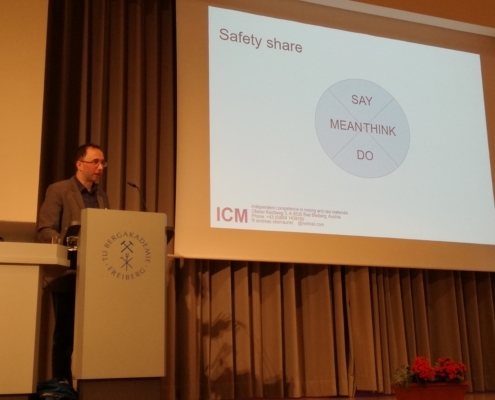 The event closed with an concise talk from Marcin Sadowski, Head of Raw Materials sector, EC EASME, where he presented the overall European policy approach to achieve sustainable goals. On the 24th of October the ¡VAMOS! 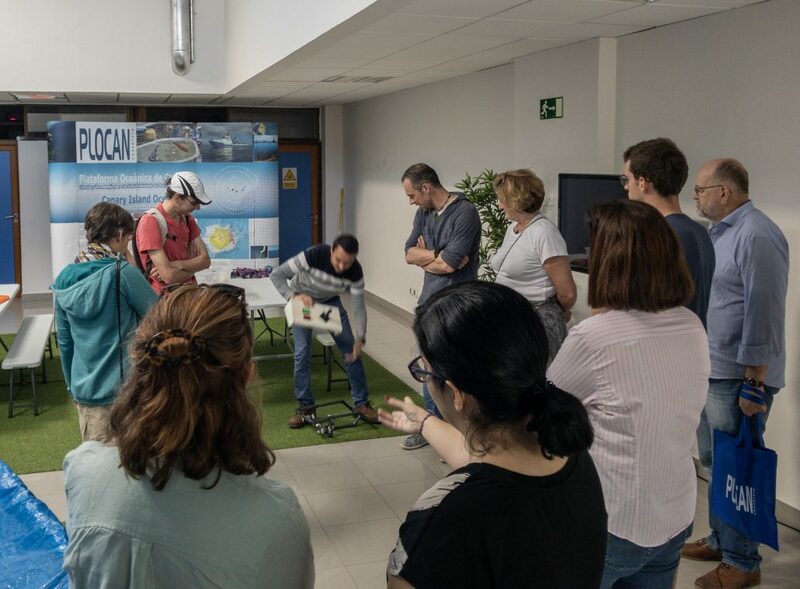 consortium, Advisory Board members, and interested external parties were invited for a live demonstration of the ¡VAMOS! 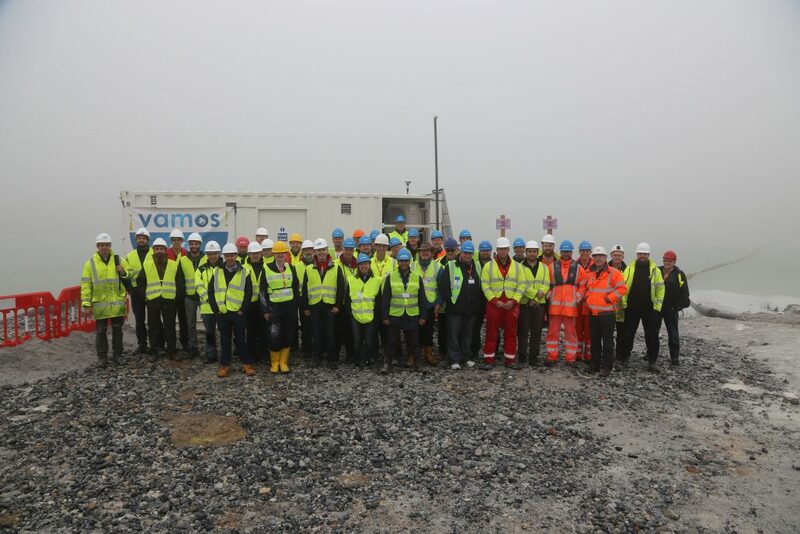 technology at the Imerys Minerals Ltd. test site in Lee Moor, Devon, UK. 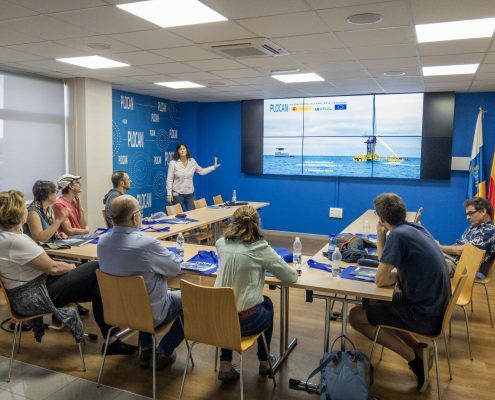 The 29 visitors were divided up in small groups and guided around the premises by representatives of project partners SMD Ltd., Damen Dredging Equipment and INESC TEC, who have been working on the various project components. 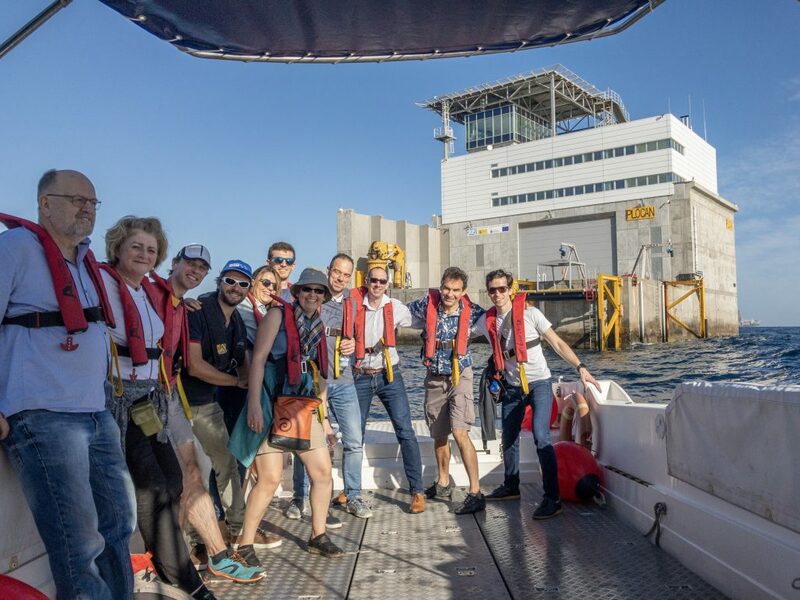 Visitors were provided with PPE and safety instructions before they were taken by boat to the Launch and Recovery Vessel, where they could inspect the Mining Vehicle and witnessed the deployment and recovery of the vehicle. 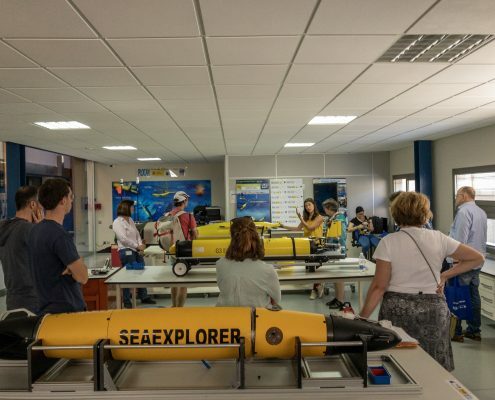 Back on shore, the visitors were given an overview of the functionality of ‘EVA’ – the Exploration VAMOS AUV, an automated underwater vehicle that is being used to assist in precise positioning, navigation and situational awareness of the Mining Vehicle and that can execute preliminary surveys of underwater mine sites. 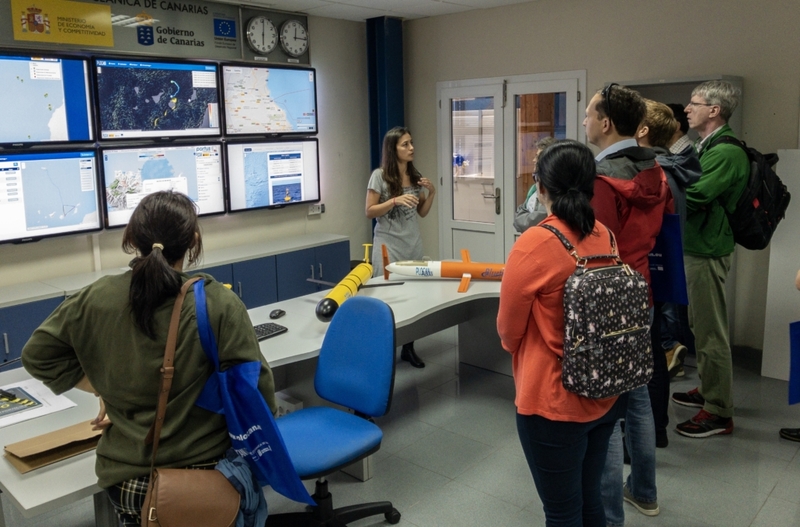 In the Control Unit and Data Centre, the visitors were shown the impressive virtual reality HMI, where all machinery is controlled and where real-time data on the operations is collected. Real-time data for grade control and mineralogical properties is collected by a LIBS – Laser Induced Breakdown Spectrometer, which was demonstrated and is being perfected for a wide range of commonly mined minerals. During the day, ¡VAMOS! 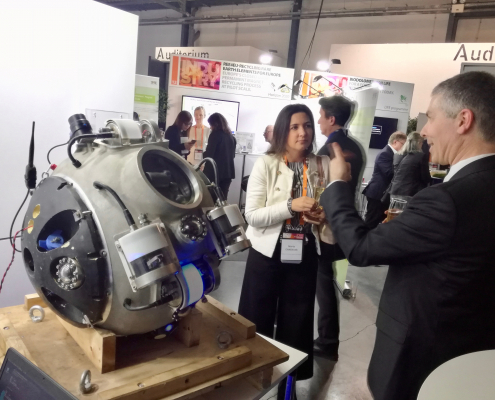 demonstrated a highly successful integration of different systems to be applied in underwater mining. 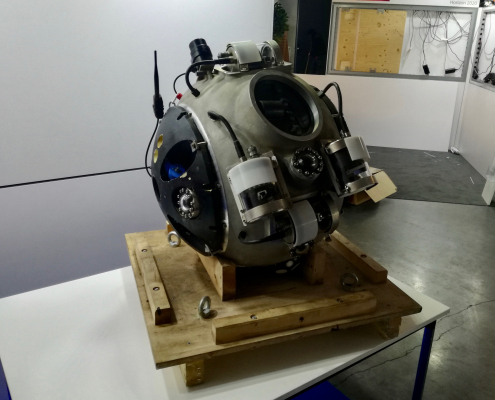 The project team was optimistic about continuing the testing until the end of the week to advance even further towards the projects targets. 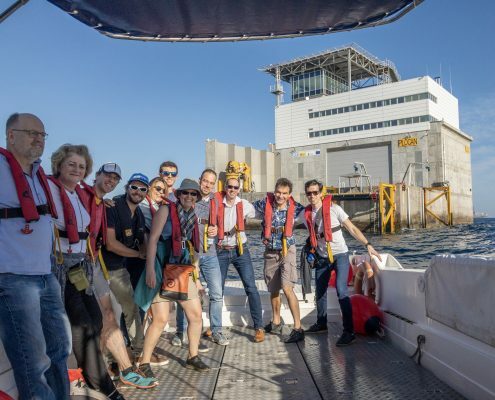 This was supported by the Advisory Board: “The consortium should be extremely proud of their efforts. What they have managed to achieve with the ¡VAMOS! 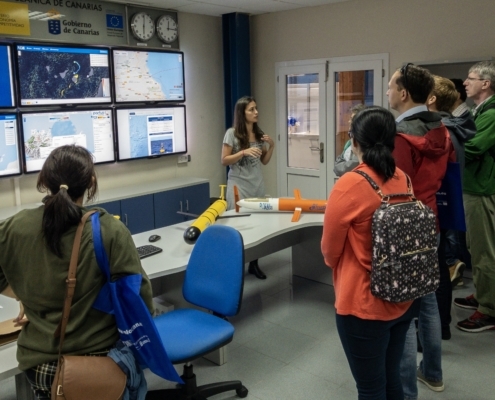 System and its integration of new technologies is very impressive”, said Dr. Bramley Murton from UK’s National Oceanography Centre. On the 31st of October the ¡VAMOS! 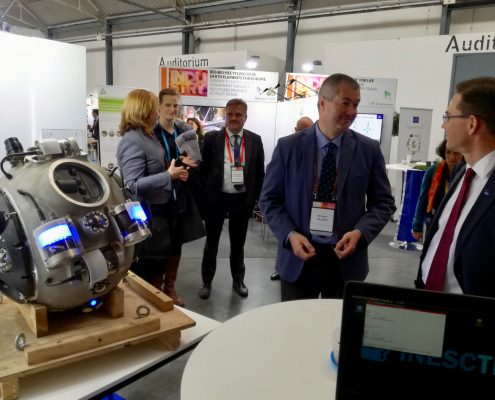 Project was reviewed by European Commission representatives and an external reviewer. 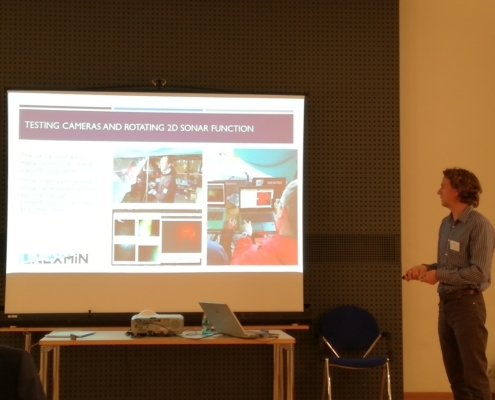 For LPRC, Edine Bakker presented the progress in Work Packages 1 and 6. 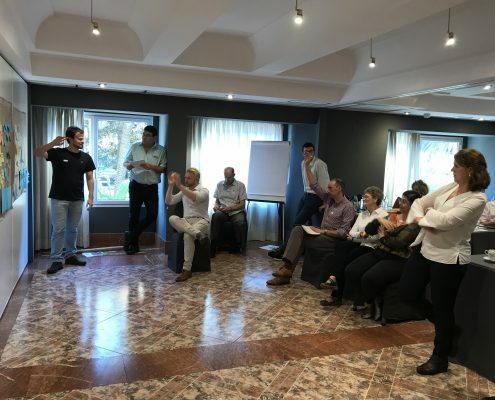 The reviewers were positive about and impressed by the projects achievements so far and the projects’ management team is optimistic about entering the final stage of the project. 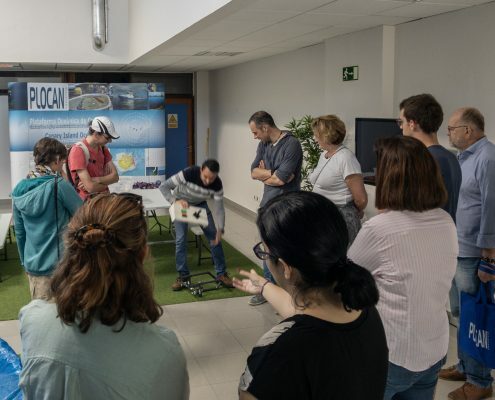 The next test will happen next year in Bosnia and Herzegovina, where the whole ¡VAMOS! technology will be once again tested in real environment!